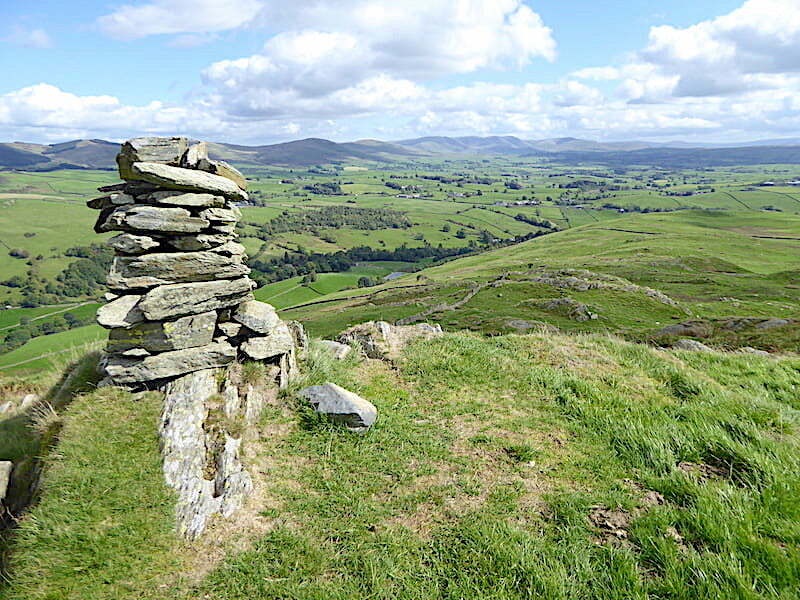 Last week it was the boulder strewn roof of England, today its a huge drop in height as we take to the much lower hills of South Lakeland, in particular a walk around Potter Fell, situated just to the east of Staveley. 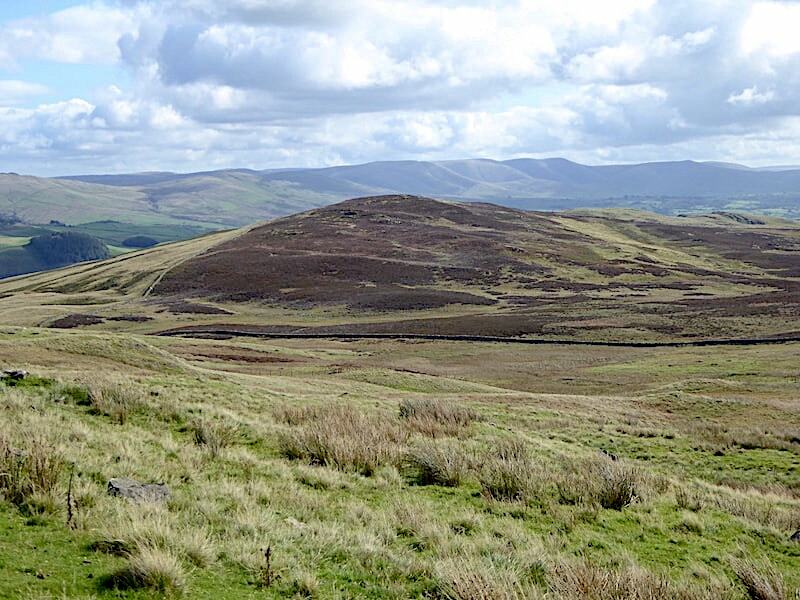 The fell has four high points, two of which do not have names and the other two being Brunt Knott and Ulgraves, and is also home to a number of tarns. 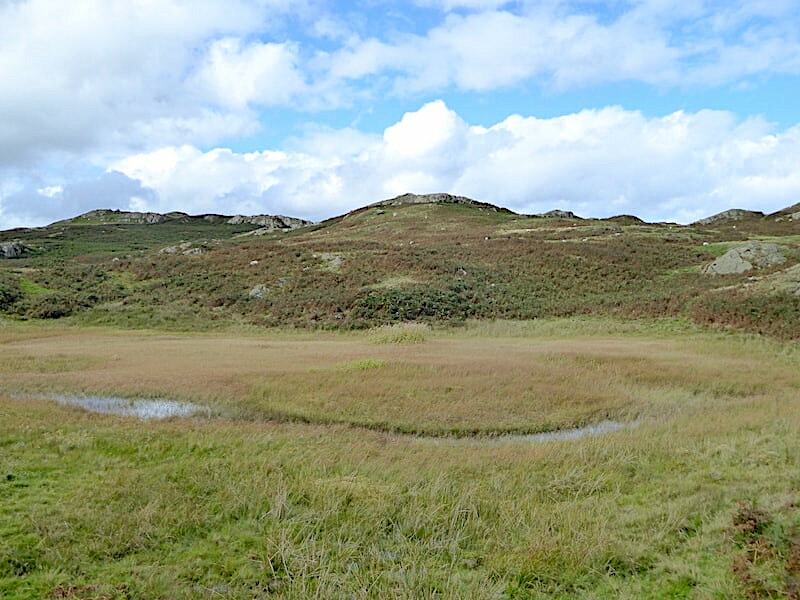 Sad to say that some of its tarns are almost entirely overgrown so they are now virtually unrecognisable as such and appear simply as reed filled marsh. 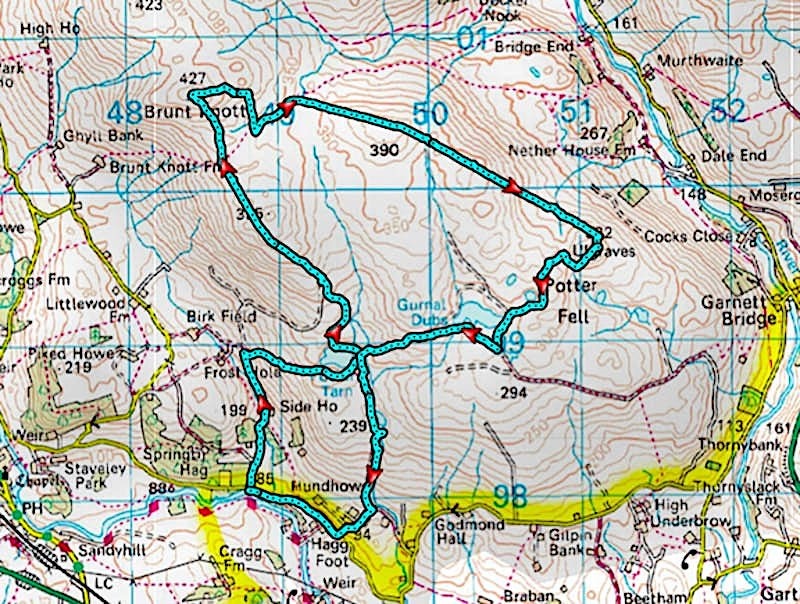 We more or less followed the route describes by AW in his guide to the Outlying Fells for today’s walk which we chose because a) we haven’t visited it before, b) the best of the fine weather would be to the east of the Park and c) its low enough not to present too many problems in the strong winds which were forecast, and walking in high winds is not exactly enjoyable. 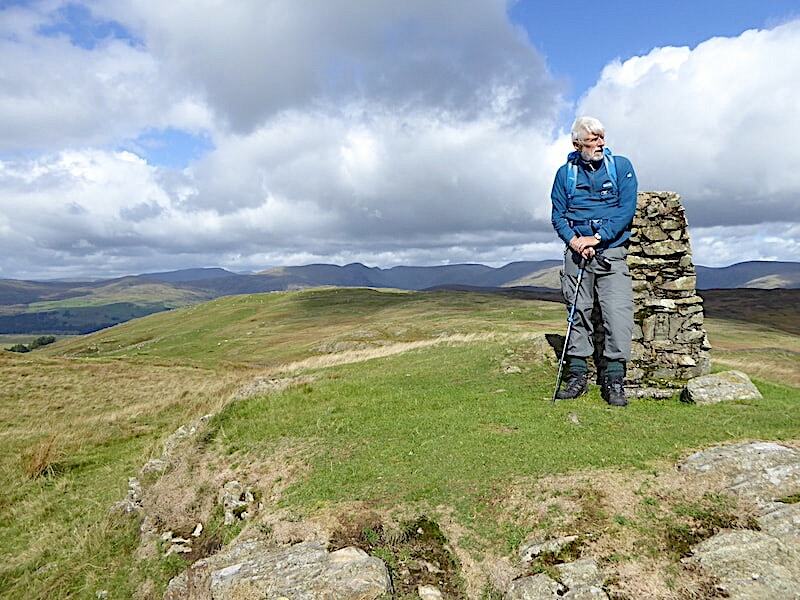 AW describes his Outlying Fells guide as suitable for anyone who can’t manage to climb the higher fells, and while it may be the case that many of them are much lower in comparison that does not necessarily make them any easier to climb. 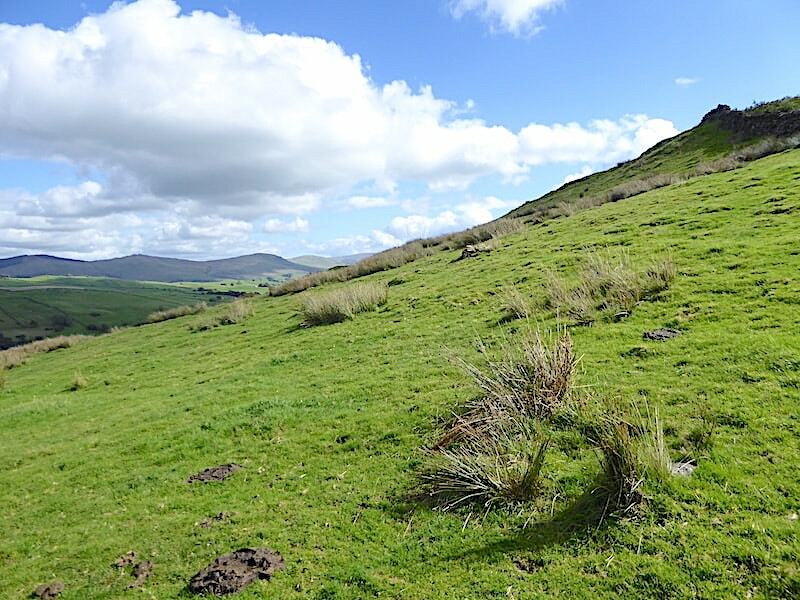 When all’s said and done, steep is steep no matter how high the hill and walkers will come across steep slopes from time to time even on these outlying fells. On the positive side though the steep bits don’t last as long. 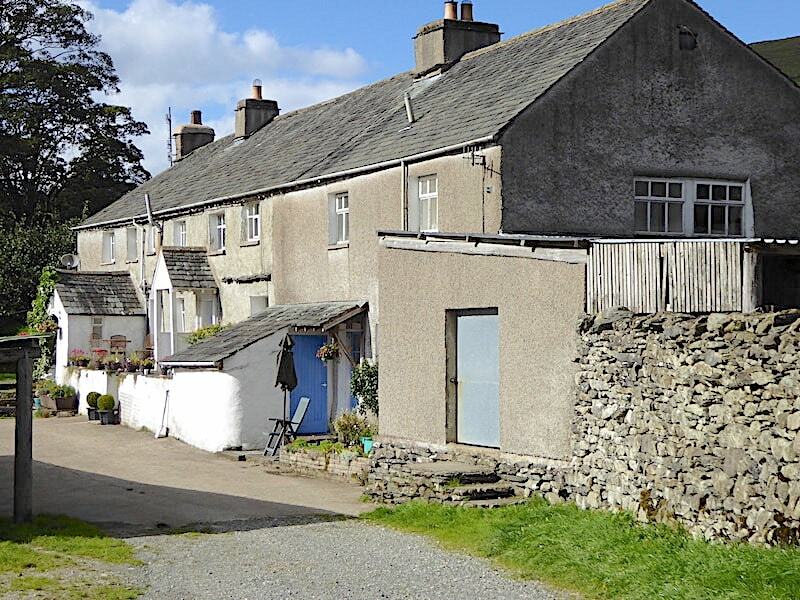 We kick off by parking on the narrow road, usually referred to as ‘the back road’, which runs between Garnett Bridge, at the south eastern end of Longsleddale, and Barley Bridge, Staveley. 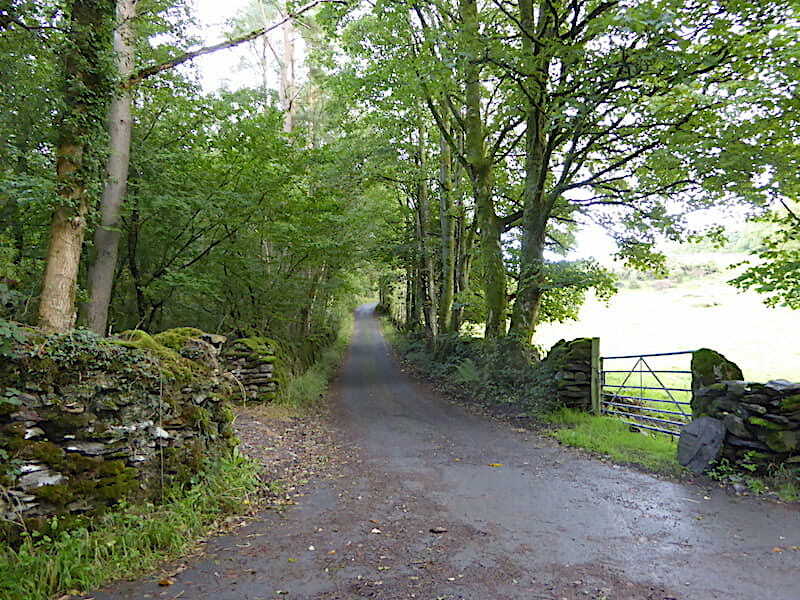 The car is parked out of shot to the left and the view is looking up the tarmac lane, which eventually turns into a rough track, and which will lead us up to Side House. It doesn’t seem to have a name so we referred to it as Spring Hag Lane, the best we could come up with as its close to the area marked on our route map as Spring Hag. We had a fair bit of rain overnight and things are feeling decidedly damp and cool. The last of the rainclouds are drifting away and the weather presenter offered the hope of brighter weather as the day wore on. We’ve brought the waterproofs just in case. 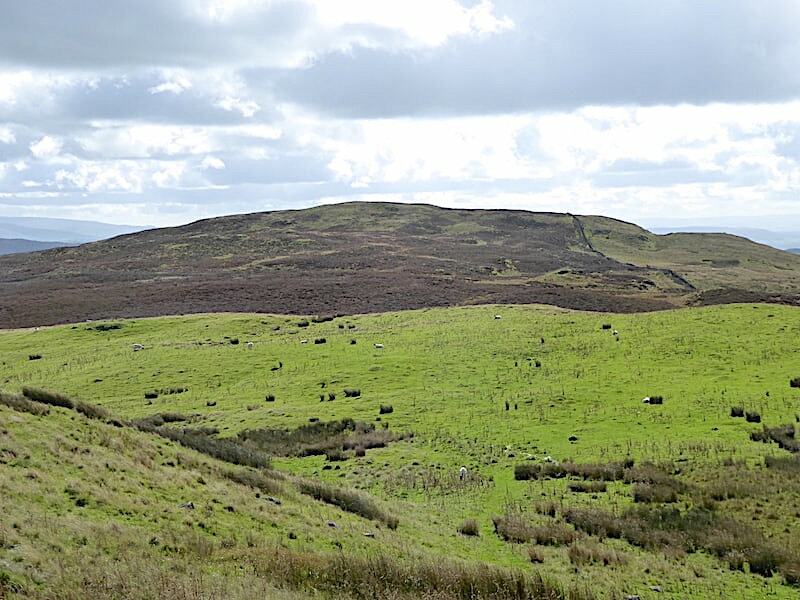 We began to walk up the steepish lane which, despite its seeming remoteness, saw two white vans, a couple of minutes apart, come speeding up behind us, so some dwelling up ahead had need of their services. 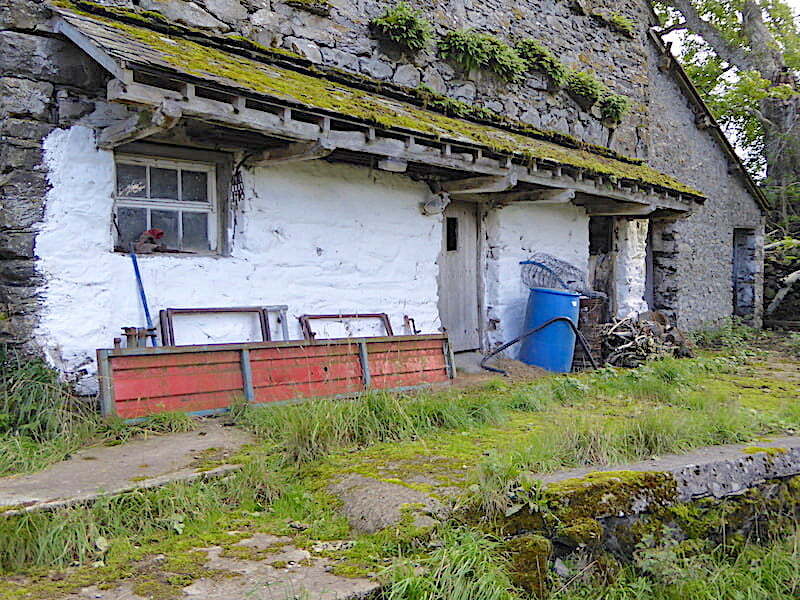 As we neared Side House we could hear the falls tumbling down the beck well before we could see them. The view wasn’t so good from the Side House bank, too many leafy trees and bushes were obscuring the view, so I took this shot from the opposite bank where the view was more open. 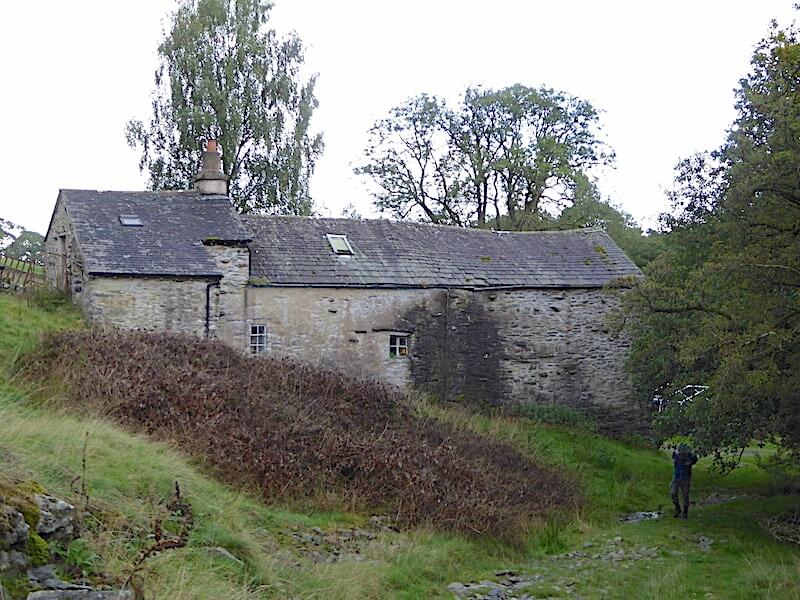 A look back at Side House as I return to the path and we carry on up the hill. The house looks a little worn and in need of attention here and there but as a light was on in one of the rooms it seemed to be inhabited. 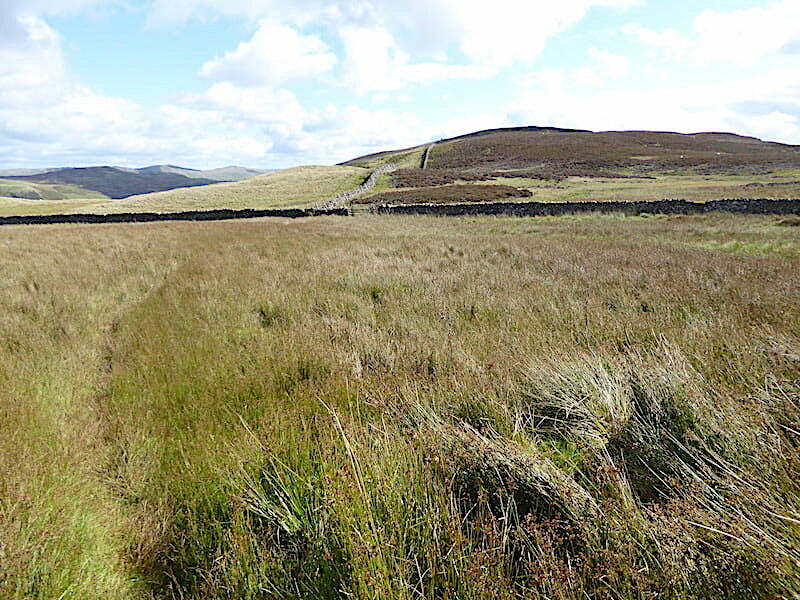 The rough loose nature of the path gives way to this grass track heading over in the direction of Brunt Knott on the skyline, but at this point we turn off to the right as indicated by the squat signpost …..
….. which is just about readable, and head up hill towards Potter Tarn. The temperature has risen somewhat, or is it just the exercise warming us up? Either way we stop and remove our jackets at this point. 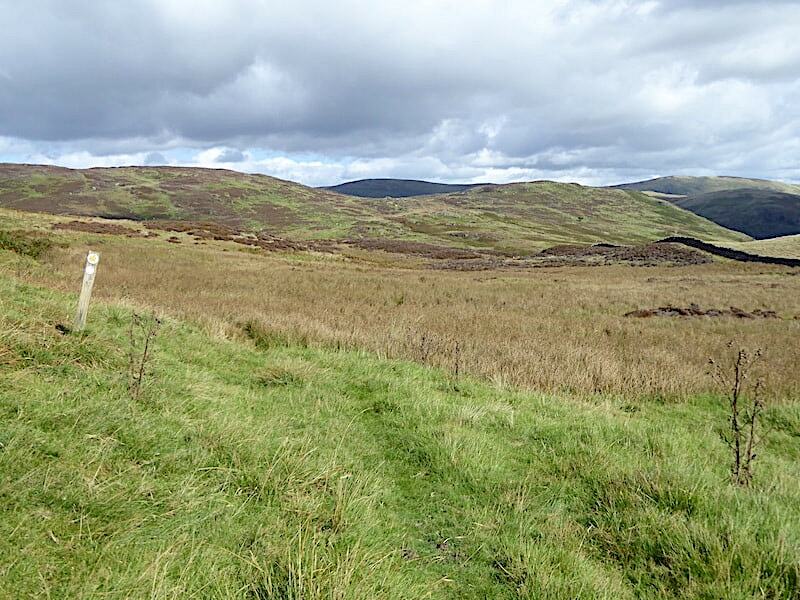 A look back at our route from the signpost, a stiffish pull up but still with a grassy path underfoot. The large clouds are still above us so we have no sun at the moment but the distant hills get an occasional splash of it. 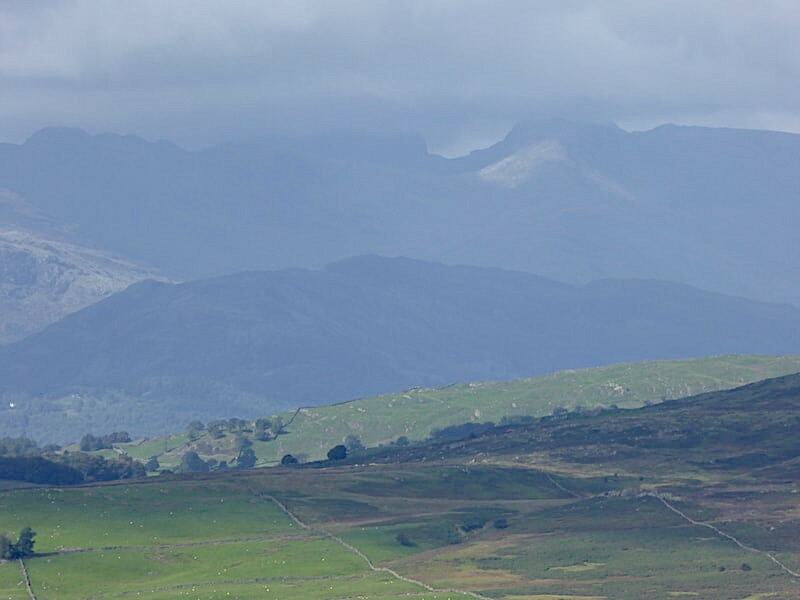 Much higher now and a zoom in on the distant Coniston fells …..
….. and another zoom to discover general murkiness over Crinkle Crags, on the left skyline, with a sunny patch over the Three Tarns Col, followed by more murk over Bowfell. 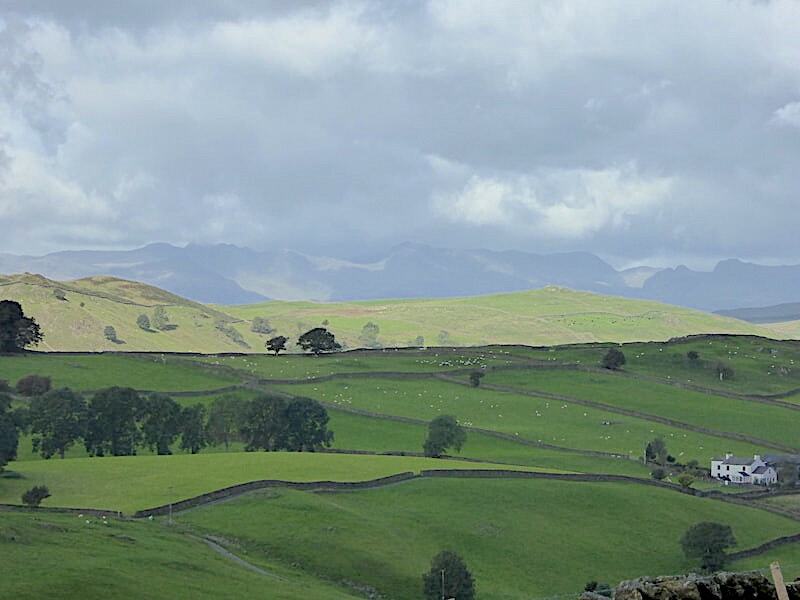 The distinctive tops of the Langdale Pikes on the extreme right are clear enough to see though. 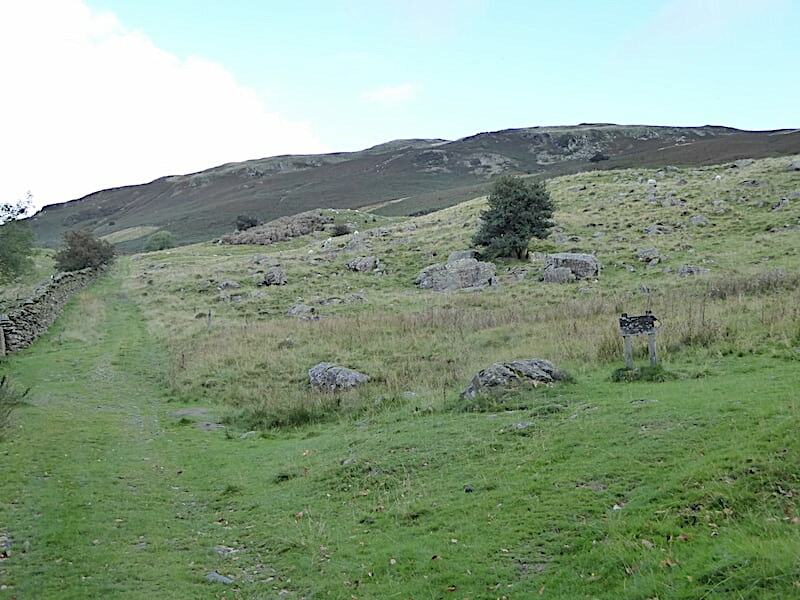 Still following the pleasant grassy path, which has been close cropped to within an inch of its life by the local four-legged inhabitants, and making our way up to Potter Tarn where one of the locals is standing guard and watching us intently. 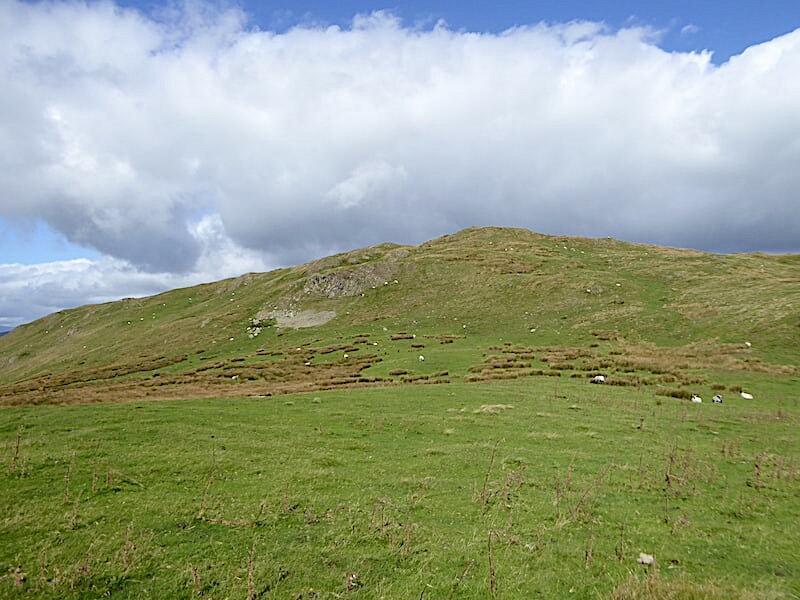 On the skyline is Ulgraves, one of Potter Fell’s four high points and the last one we’ll visit today. 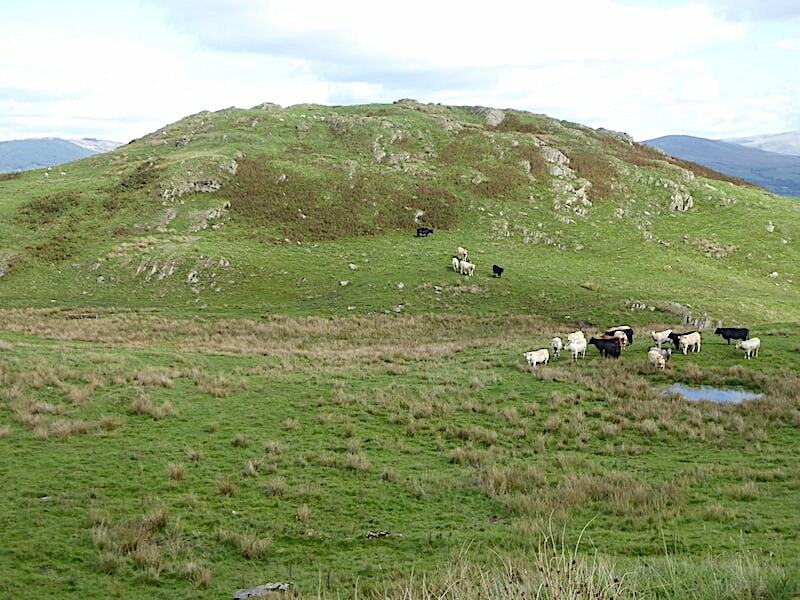 We brave the cow, although in truth it lost interest in us as we got closer and ambled off, and made our way up to and around Potter Tarn. 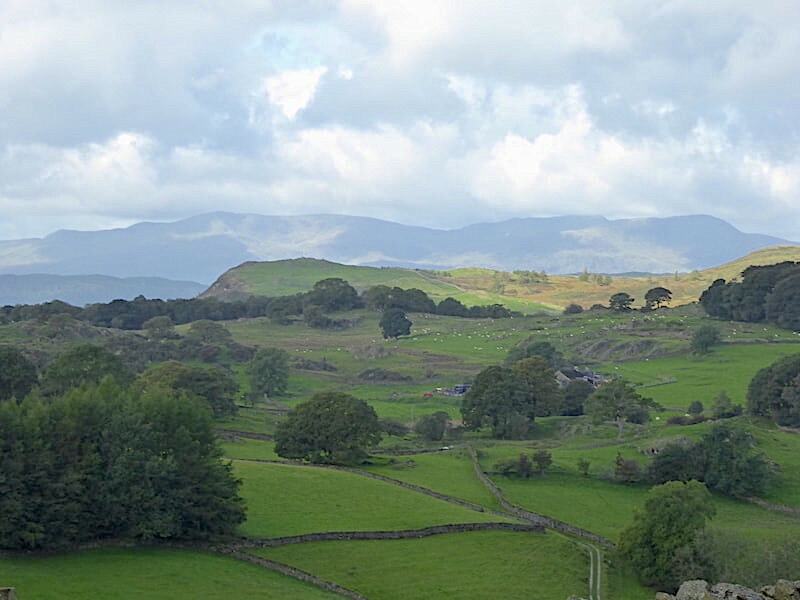 Opposite us is Potter Fell’s first unnamed and unmarked summit with Brunt Knott largely out of sight and some distance behind it. 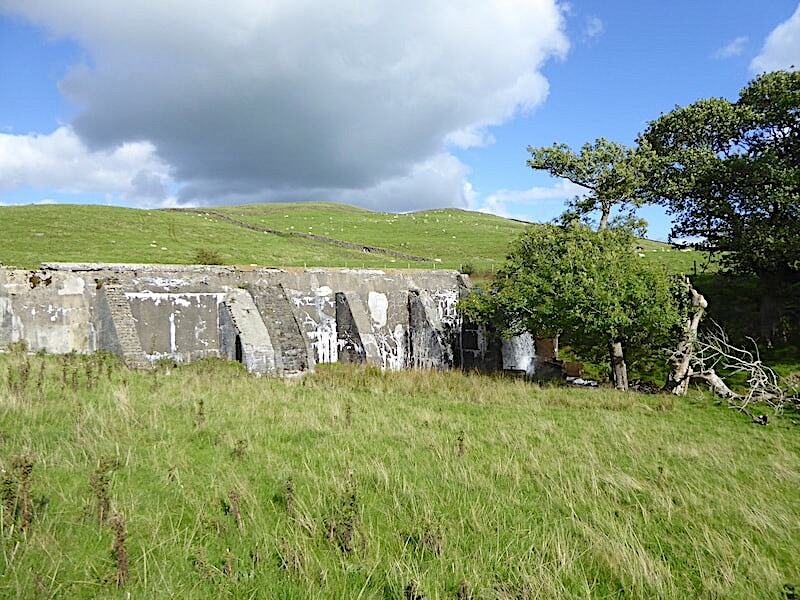 We follow the path around Potter Tarn and drop down alongside the dam wall …..
….. and cross the outflow using the convenient, and dry, concrete blocks. The stream below it could have been crossed just as easily but something a bit different provides a moment or two of entertainment and they definitely won’t wobble. 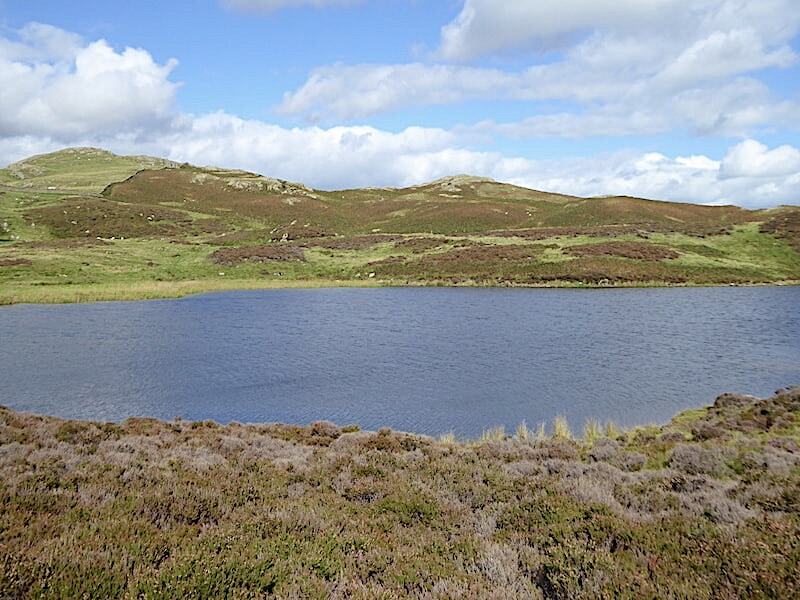 We’ve rounded the tarn at this point and here I’m looking up towards the first unnamed summit. As I was taking the shot another walker arrived and stopped to remove his jumper, informing us as he did so that there was a bull in the field up there yesterday. I’m not sure quite what we were meant to do about that, especially as all we could see were sheep but perhaps he was trying to be helpful. As things turned out we didn’t see a bull anywhere at all during our walk, not that it would have bothered us if we had, we ignore them and they ignore us. The solo walker headed off in the direction of Ulgraves and we were left alone once again to enjoy the tranquil view. 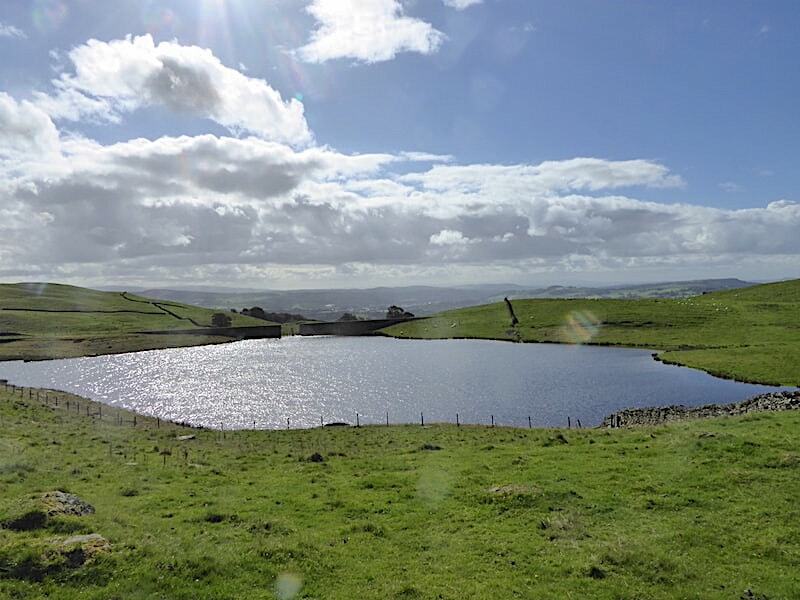 The clouds drift away eastwards and the sunlight casts a lovely sparkle across the breeze ruffled surface of the tarn. From the tarn we carried on up the hill, the close cropped grassy path having given way to more tussocky and roughish ground, and gained the unnamed summit at 1296’/395m. 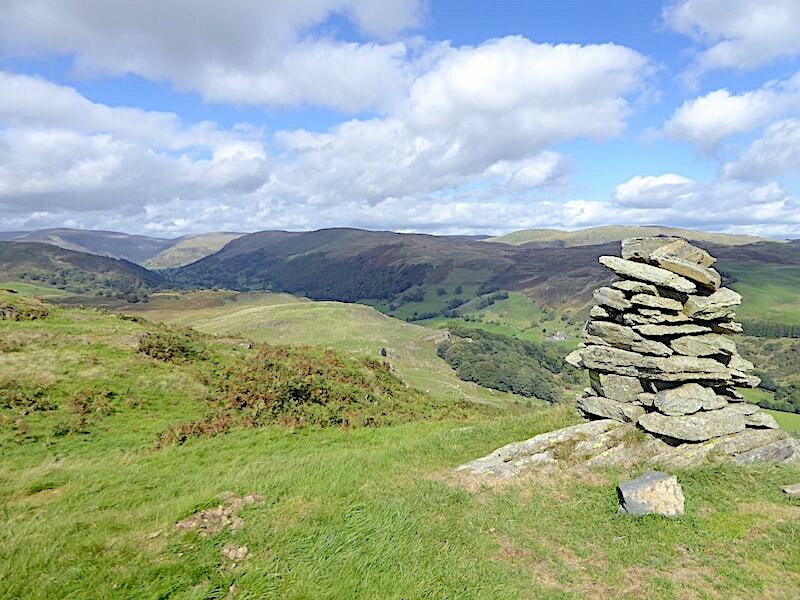 There’s no cairn, well not that I could find anyway, to mark the high point but on the skyline was this view of the Whinfell ridge which we walked over in May as part of our ‘The Other Borrowdale’ walk. 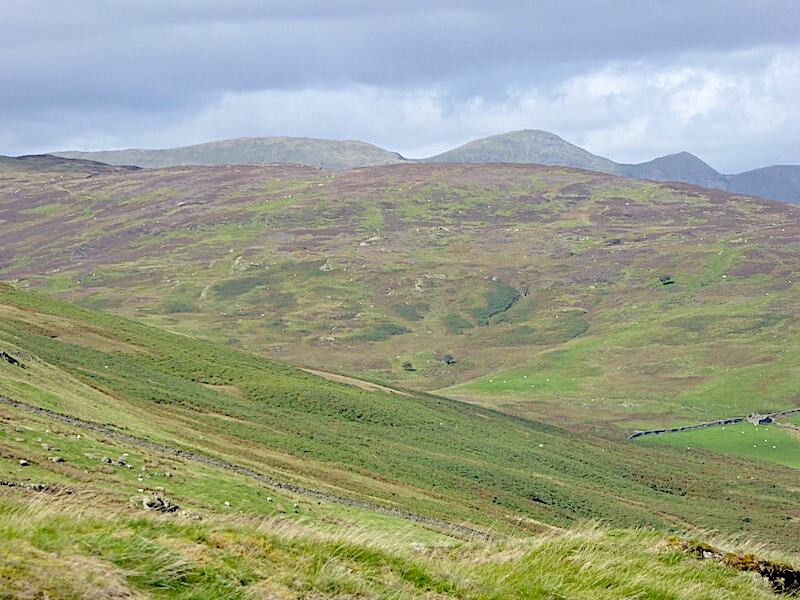 From left to right we can see Ashstead Fell, Mabbin Crag, the two tops of Old High and Castle Fell, Whinfell Beacon and Grayrigg Pike. It was quite draughty up here by now, and more than a little chilly when one of the larger clouds blotted out the sun for a few minutes, so we didn’t hang around too long. From the unnamed summit we head downhill again and make our way towards Brunt Knott. More rough, uneven ground ahead with some splashy areas dotted along it, but by and large it was firm and dry so we made decent progress. A Mars Bar stop was taken when we came across a small outcrop which offered a sunny and sheltered spot for a brief break. Out came the flask of coffee too, a welcome hot drink in the very cool breeze. Its been months since we brought a hot drink in our packs, a small but significant sign that the times they are a-changing and we are gradually drifting into autumn. 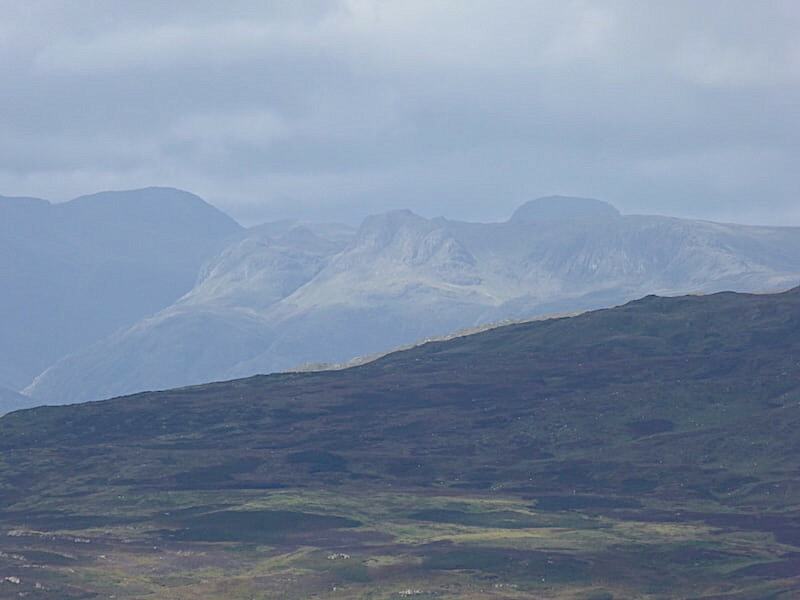 As we set off again I took another look over towards the fells to the west where the cloud base had lifted leaving most of their tops clear now. 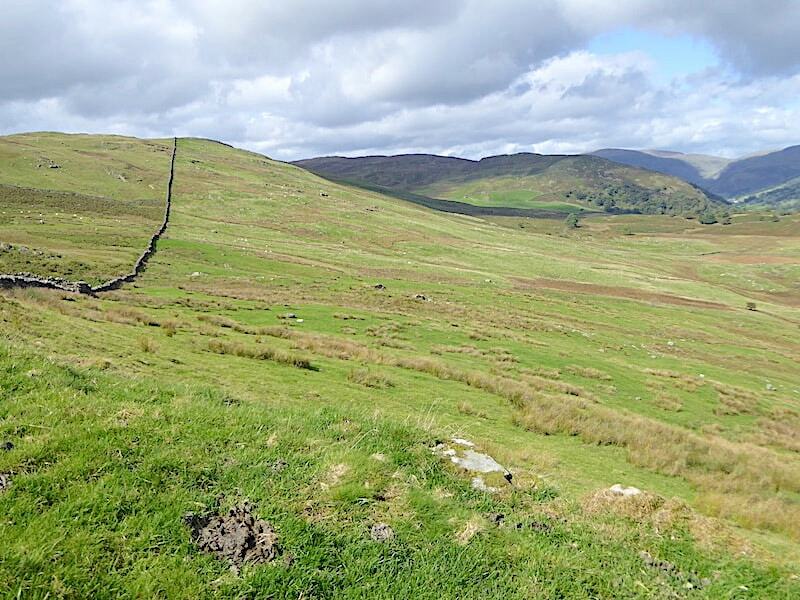 We carry on down to the depression, cross the wall via the stile and begin the climb up Brunt Knott. We had intended to take a look at AW’s ‘wall through a pool’ a little way to the right of the wall before heading uphill again but forgot all about it when we got there, probably because we were nattering again. 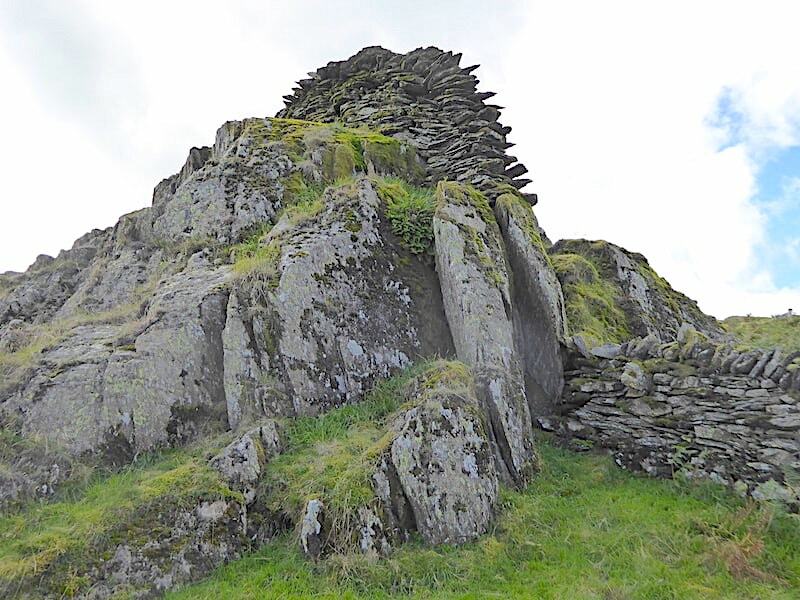 We passed on the idea of reaching the top via a scramble over the outcrop and stuck to the grassy path to the right, now close cropped once again. From the climb a look back at the unnamed first summit. 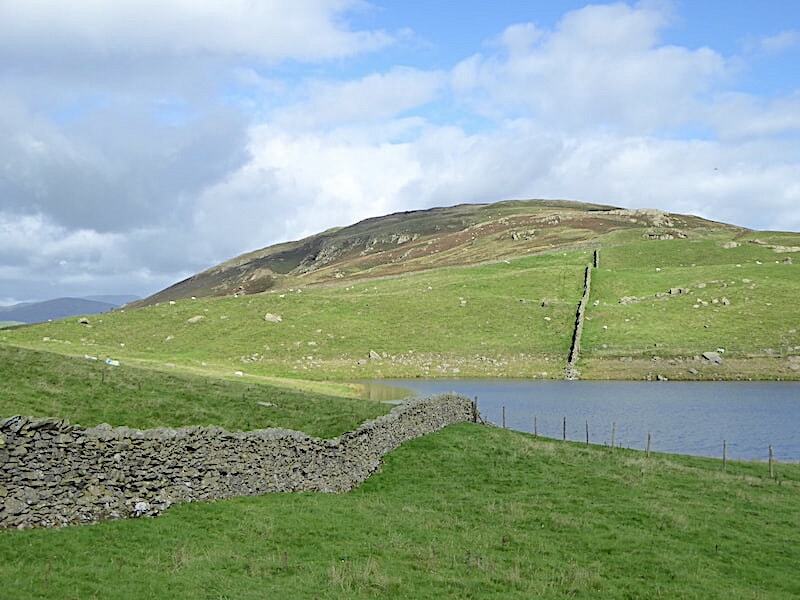 Between the grassy slopes of Brunt Knott and the heathery ones of the unnamed top is the walled depression we have just crossed and where the ‘wall through a pool’ is situated. 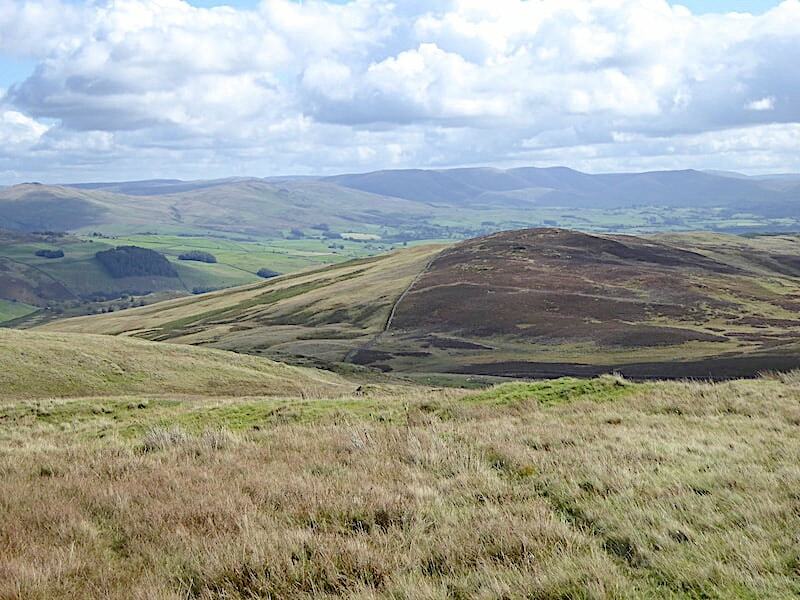 A steepish climb brings us out at the trig column on the top of Brunt Knott with a view of some of the Shap fells on the skyline. 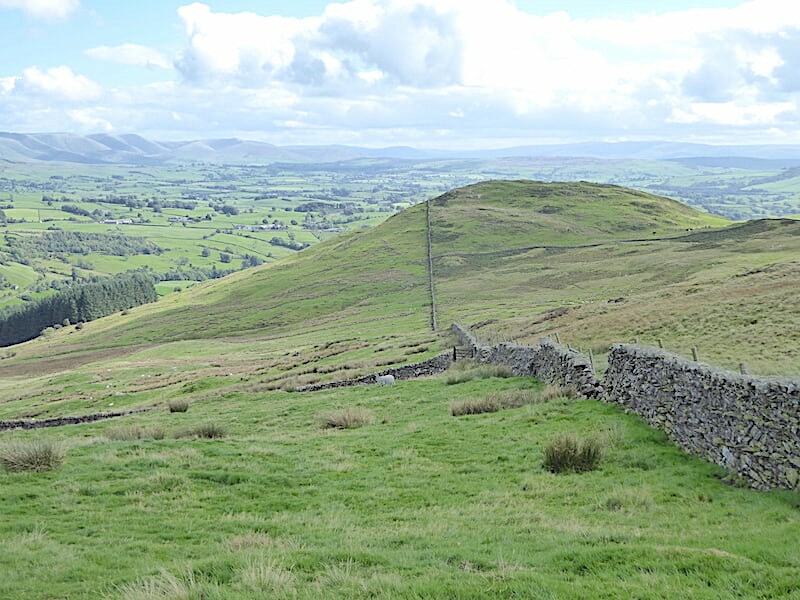 Brunt Knott stands at 1401’/427m and offers some extensive views although there was too much cloud shadow around today to see them at their best. From the top I took a look down towards Potter Fell’s second unnamed top which is where we’ll be heading next, but first I take a look at some of the views on offer …..
….. a long zoom for a look at the Langdale Pikes getting the benefit of a sunny spell. The rounded top of Great Gable just behind them with Great End over to the left …..
….. the cloud is down again over Crinkle Crags and Bowfell although The Band has a splash of sun on its slopes …..
….. Yoke and Rainsborrow Crag bathed in sunshine although Ill Bell and Froswick behind them aren’t quite so lucky …..
….. looking towards the head of the Kentmere valley where Thornthwaite Crag, High Street, Lingmell End and Mardale Ill Bell are also looking a little on the glum side …..
….. looking towards the other section of the Kentmere Horseshoe at Harter Fell, Kentmere Pike and Shipman Knotts, from left to right respectively …..
….. a little further to my right and another valley head appears, this time that of Longsleddale where Branstree is in full sun and Tarn Crag isn’t …..
….. J admires the view to the south while I’m looking straight at the Kentmere Horseshoe on the centre skyline …..
….. behind the heathery hill across there is the valley of Longsleddale above which rise the fells at the southern end of the valley. 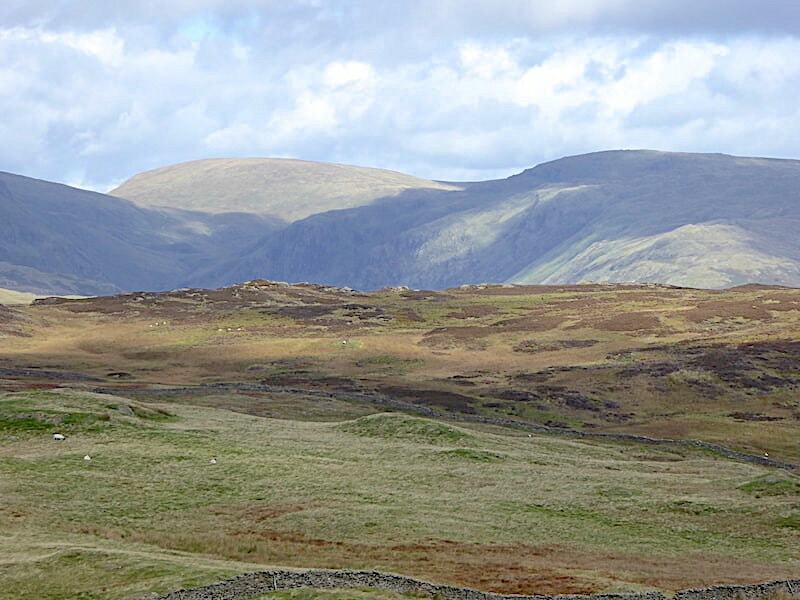 They form the western section of the Bannisdale Horseshoe, the fells forming the eastern section of it can be seen on the skyline behind the long grassy ridge, which I think is leading up to Capplebarrow, although with one grassy hill looking very much like every other its hard to be certain. So, after a good look round and my hands getting thoroughly chilled in the cool north westerly down we go, back to the depression and its wall in readiness for the long hike over to Ulgraves. The second unnamed top is right below us but we have already decided that we will not be crossing its tangled, heathery slopes up to the highest point but will keep to the left of the wall instead. 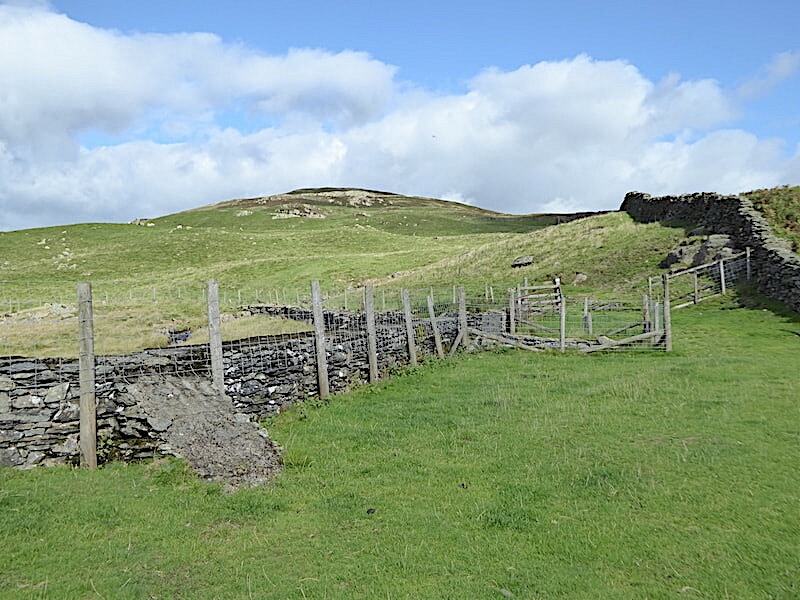 The land to the right of the wall is crossed by walls which do not have gates or stiles, the land to the left of the wall also has walls but they have gates which makes for a much easier pass through. 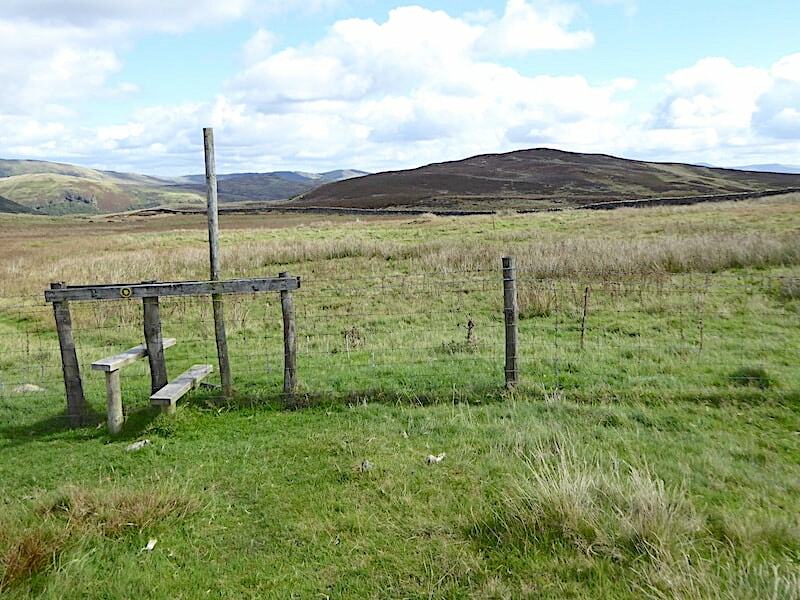 Before we get to the wall there’s a wire fence to be crossed courtesy of this stile, with a narrow grassy path leading off to the left of it. Its a whole lot warmer down here now we’re out of the cool breeze, with plenty of warm sunshine too. 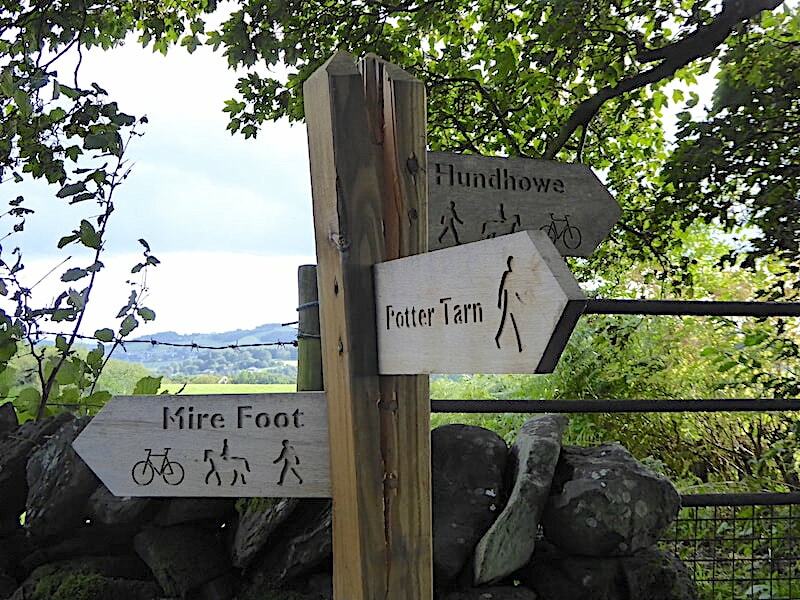 At the guide post we take a right turn and …..
….. make our way across the flat and watery ground to the wall …..
….. where there are two stiles. Not wanting to tangle with the heather and the ungated cross walls we use the left hand stile and make our way steadily up the rise and begin the mile and a half walk over to Ulgraves. 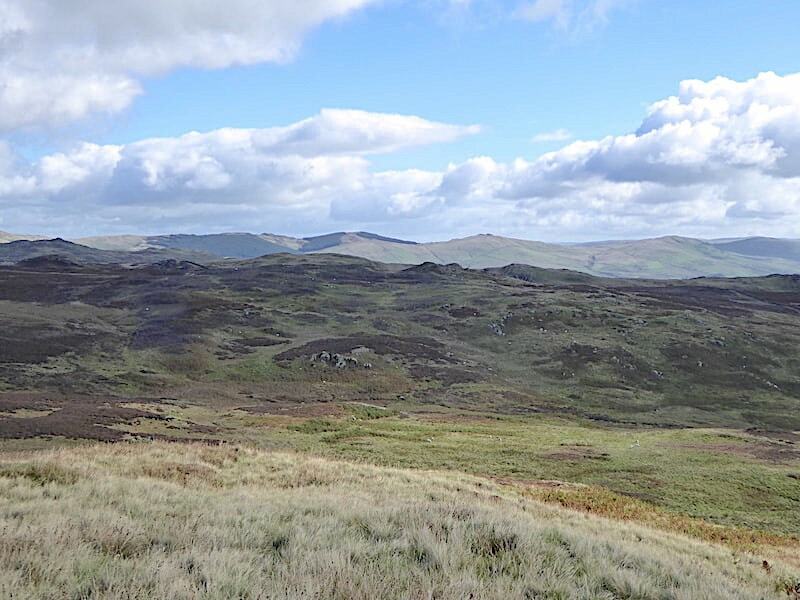 A look back to Brunt Knott as we climb the stiff slope …..
….. with another view of Ashstead Fell, Mabbin Crag and Castle Fell over towards the east of us …..
….. Castle Fell once more, with the other tops of Whinfell Beacon and Grayrigg Pike a little further along to the right. Directly ahead is Ulgraves so now we have to lose some height only to have to regain it, a recurring theme of the walk across. 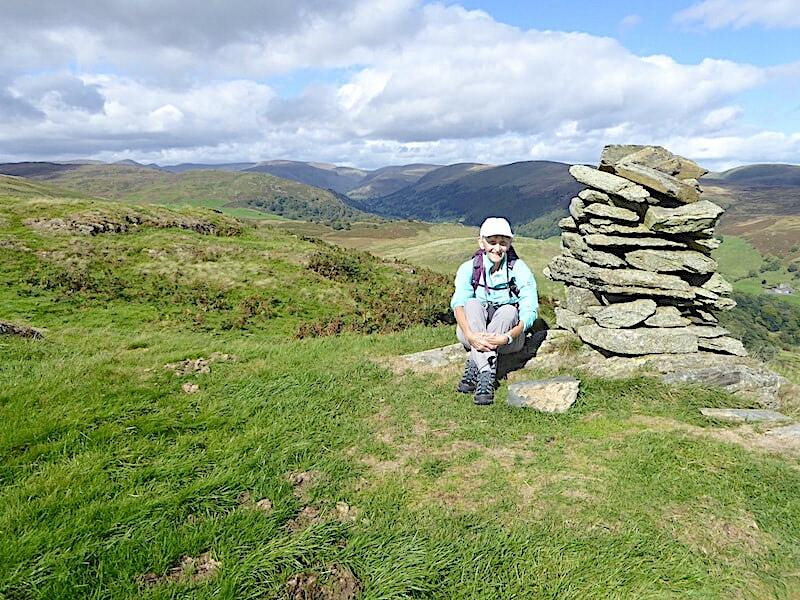 Our right legs are now suffering from what we call ‘Birkett Leg’, an ache which frequently occurs when walking a long way with one leg constantly being higher than the other across the sloping ground. 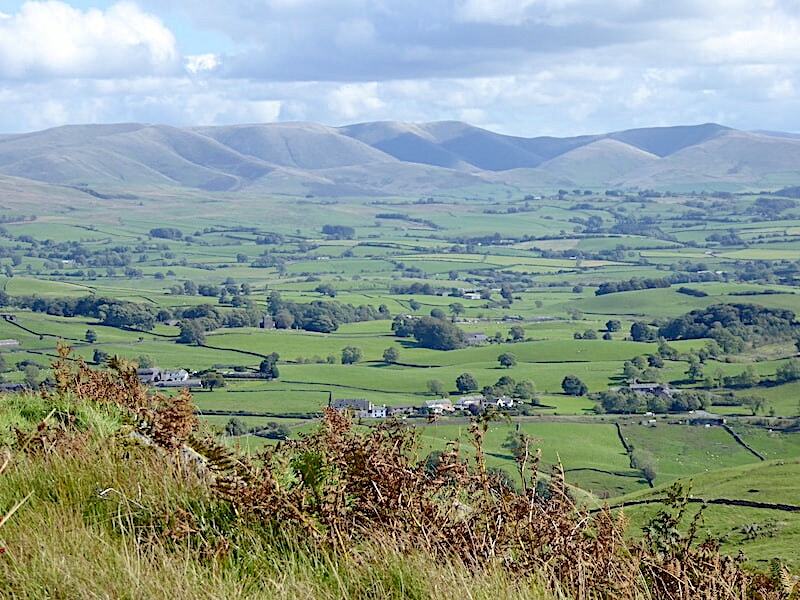 To the south is AW’s ‘herd of sleeping elephants’, also known as the Howgill Fells. Just one more little steep bit to go before we find a place to cross the wall and reach the top of Ulgraves. There was a gate giving access to the right hand side of the wall a little way back but we chose not to use it and take our chances at the high point of the wall. Before we do though I find a handy rock and take a couple of minutes to try and get rid of the ache in my right leg. The muscles on my right side are the ones which can tighten up and give me the back problems I’ve been having from time to time so I’m trying not to aggravate them. The second unnamed high point back there, which we crossed just below, stands at 1280’/390m. 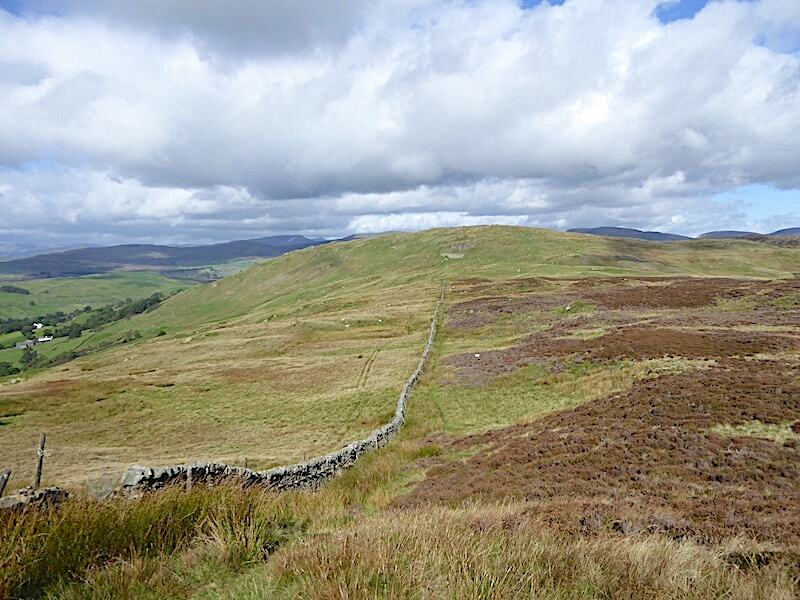 The wall crossing was accomplished without any great difficulty after which there was just a short but steep climb through the dying bracken up to the cairn at the top. 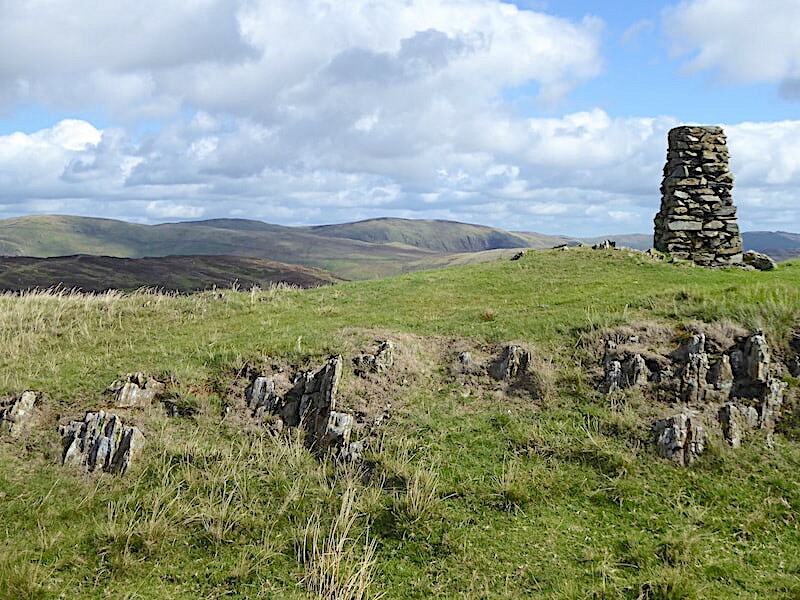 The cairn isn’t situated at the highest point of Ulgraves, which is on one of the many outcrops out of shot to the right and stands at 1089’/332m, but it is situated, more or less, right above the entrance to the Longsleddale valley. 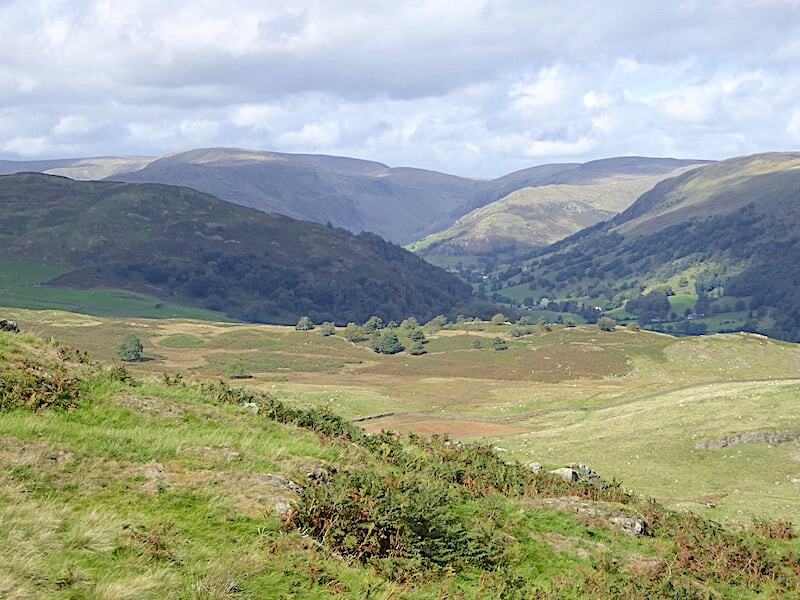 Anyone who has driven along Longsleddale will be familiar with the sharp turn off the A6 leading down to the very narrow road leading to the parking area at Sadgill. 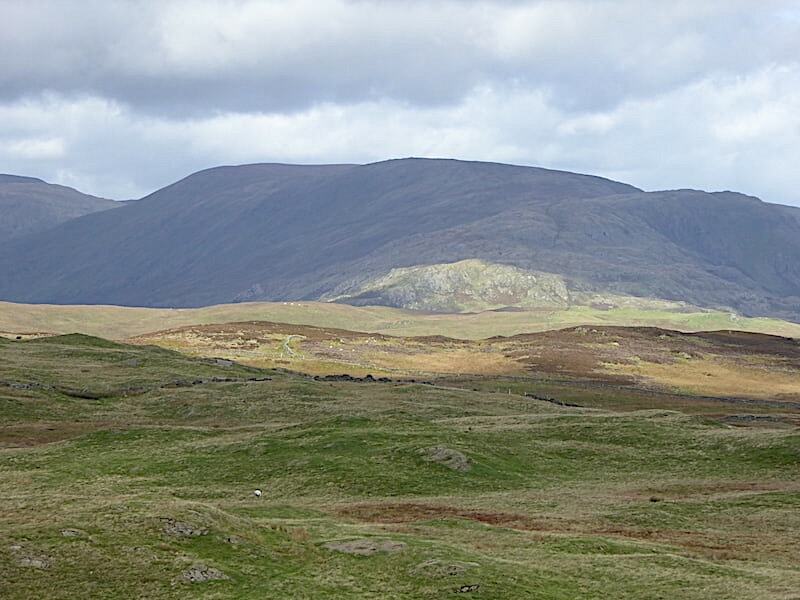 There’s a commanding view along Longsleddale from the cairn. 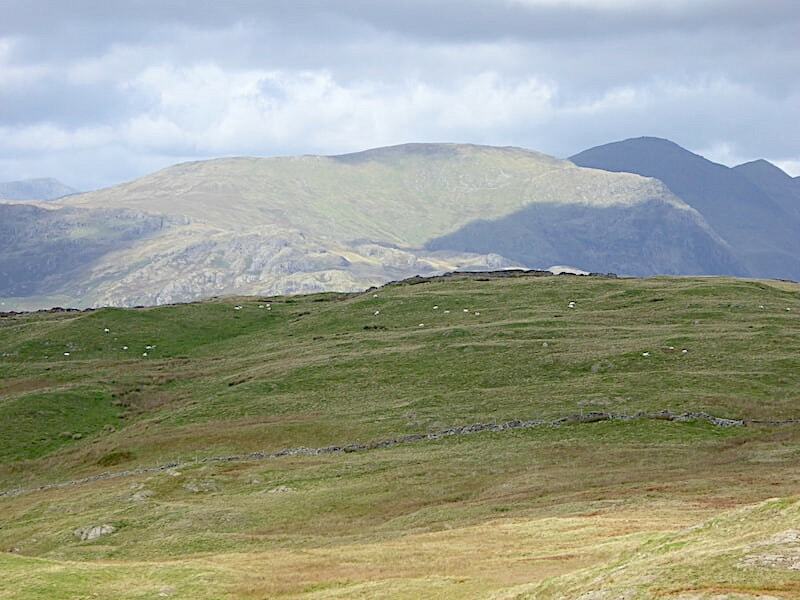 The line of fells in the shade behind the cairn form the western arm of the Bannisdale Horseshoe, another walk detailed in AW’s guide to the outlying fells. Beyond the last one in the shade, Ancrow Brow, are the sunnier slopes of Grey Crag and Tarn Crag closer to the head of the valley. 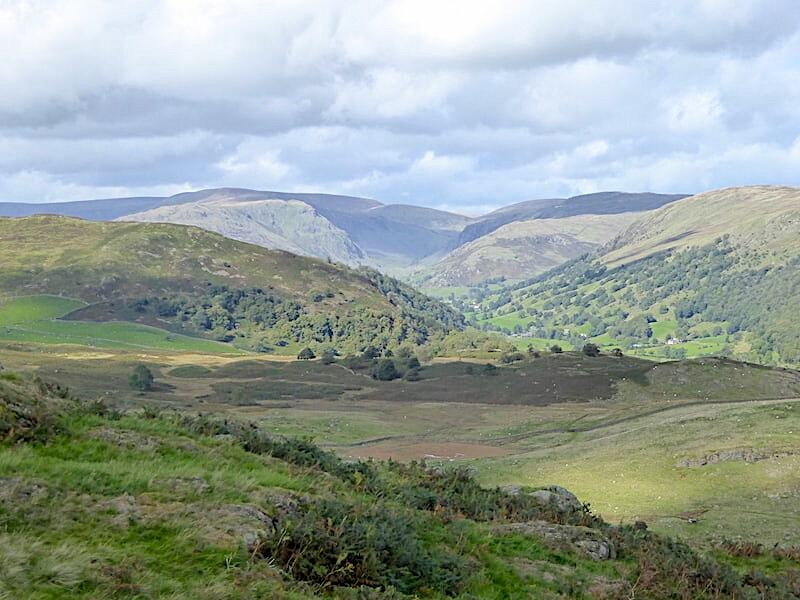 A closer look at the Longsleddale valley. 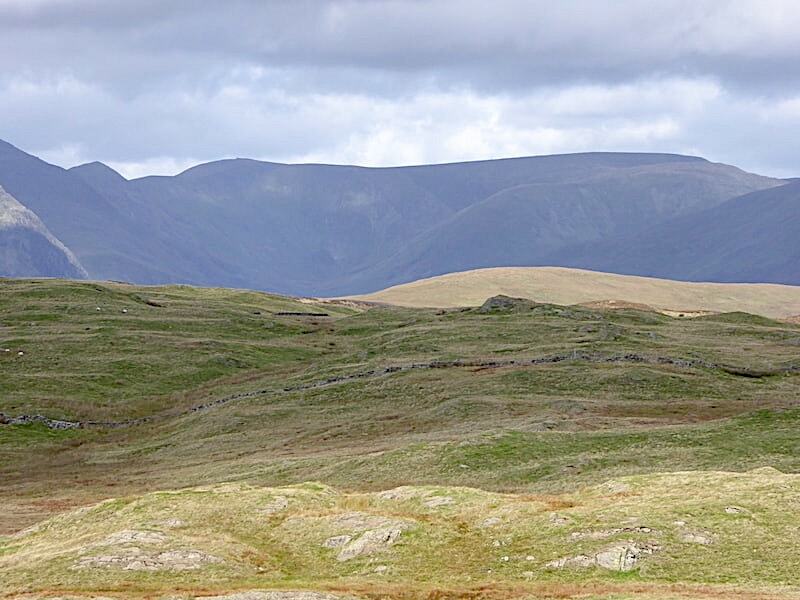 A look over to the north west where only the very tops of Yoke, Ill Bell, Froswick and Thornthwaite Crag are on view. Enjoying some sunny downtime at the cairn while waiting for my right leg to stop whingeing. 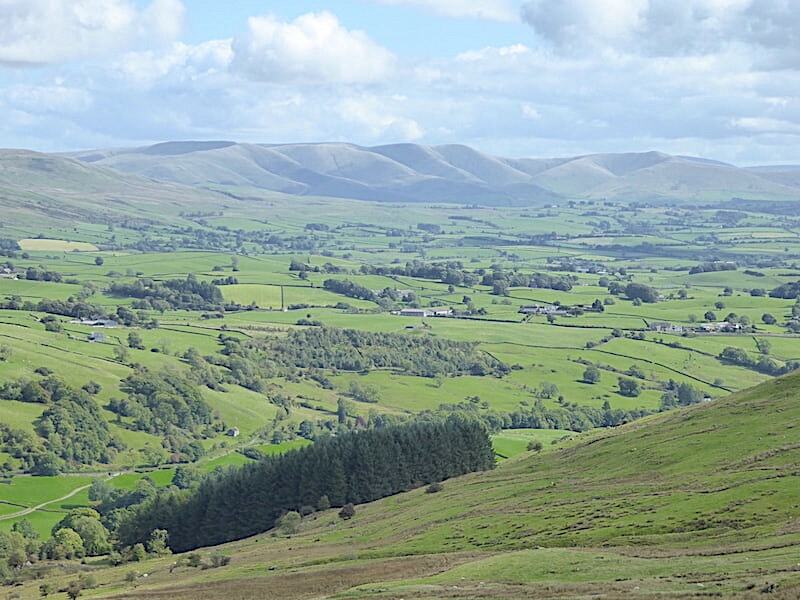 Before heading back down we found ourselves a sunny spot sheltered from the cool breeze, took a lunch break and gazed across at the Howgills over the lush farmland to the east of Kendal. Hidden from view between here and the foothills of the Howgills the M6 snakes through the Lune Gorge and makes its way up to Penrith and Carlisle. 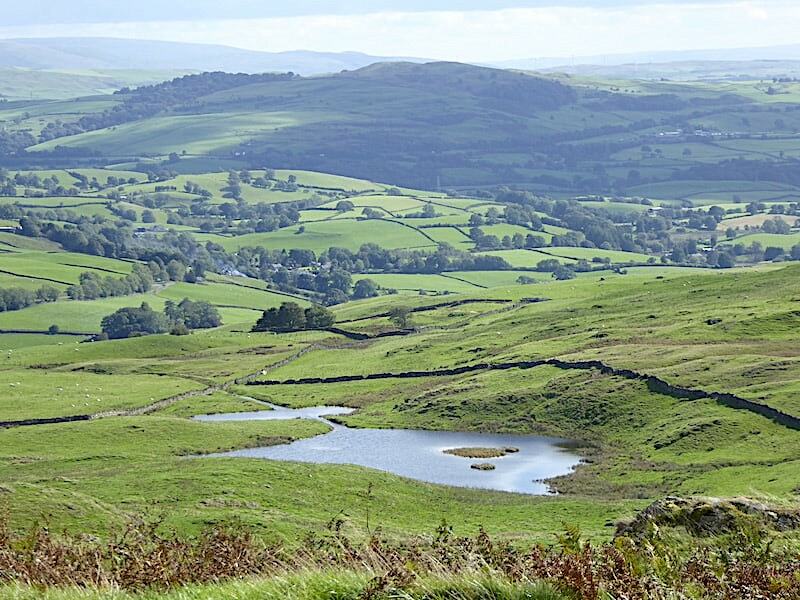 The rolling countryside of the Kent Valley, together with the gentle slopes of Benson Knott and a couple of unnamed tarns, directly below us provided a very pleasant view while we were enjoying our lunch. We had put the sit mats on the damp grass and there we were, tucking in, gazing at the views and chatting away, when gradually I became aware of some slight and intermittent movements underneath my rear end. To begin with I thought it was just my sit mat slipping over the damp and uneven grass but when it continued I realised it wasn’t. Given the nature of the movement my first thought was that it might be a small grass snake so I rolled off to one side of the mat and found …..
….. not a small grass snake but this little frog sitting on my mat. I’m still trying to work out how the heck it had managed to squeeze in between my rear end and the mat. By the time I had the camera out it had moved further into the vegetation, so I have a very sharp shot of dead bracken stems and a rather fuzzy one of the interloper. I tried for clearer shots but every time I moved the stems it buried itself further into the grass until it eventually disappeared. 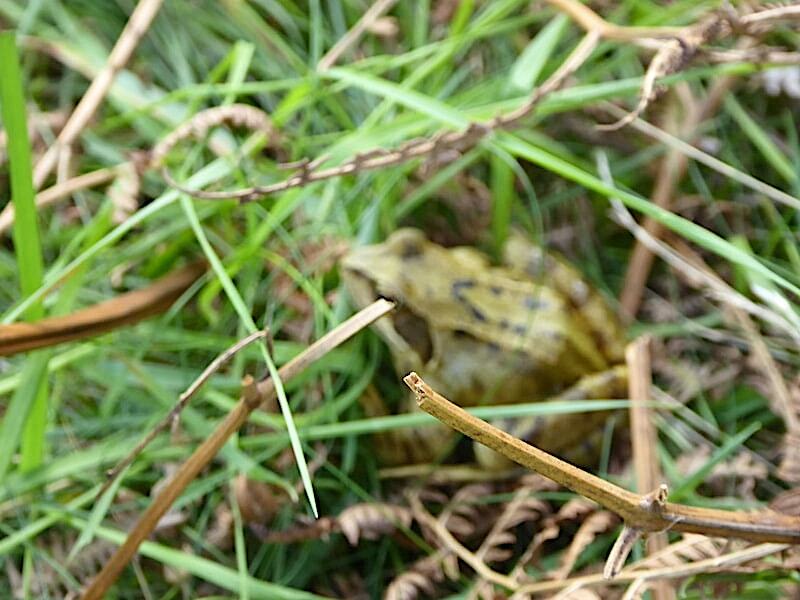 We often see frogs when we’re out walking but I’ve never had as close an encounter with one as this. As we were getting ready to descend I noticed that things had brightened up along Longsleddale so here’s another shot of it with a very sunny Goat Scar showing up particularly well above the green ridge over on the left. 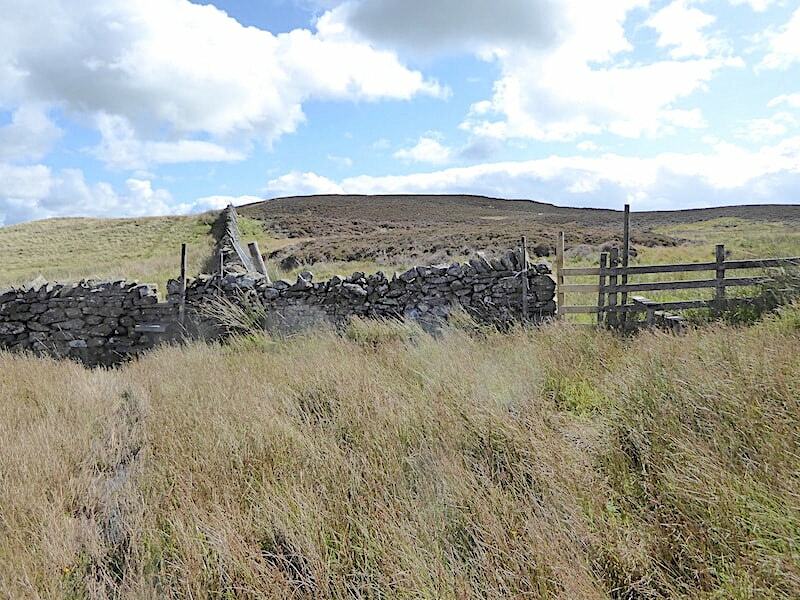 We make our way off Ulgraves with this look back at it as we climb the next rocky rise where …..
….. a wonderful example of creative dry stone walling can be seen. 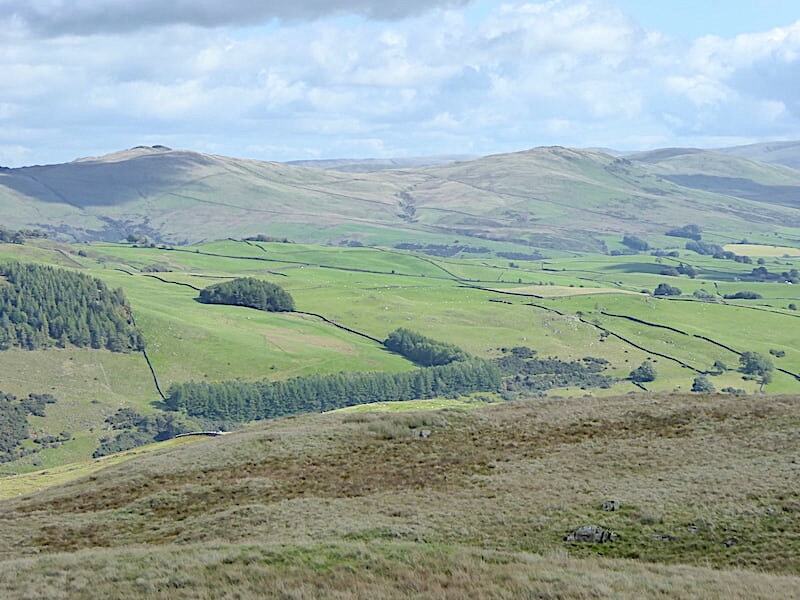 This is the view as we approached it and …..
….. the view as we passed alongside. A serious bit of stone walling by a craftsman who seemed determined that no sheep should ever get over or around his wall. 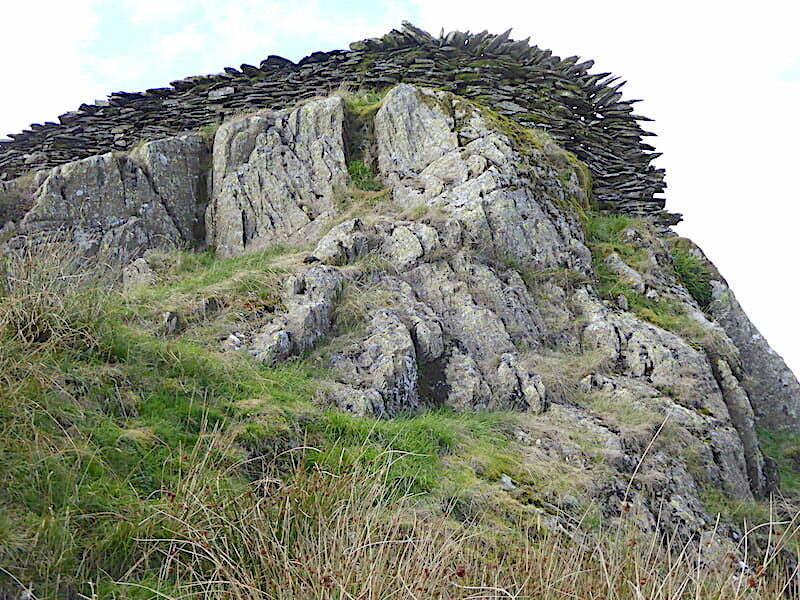 It brought to mind a similar wall which can be found on Little Gowder Crag above Ennerdale. 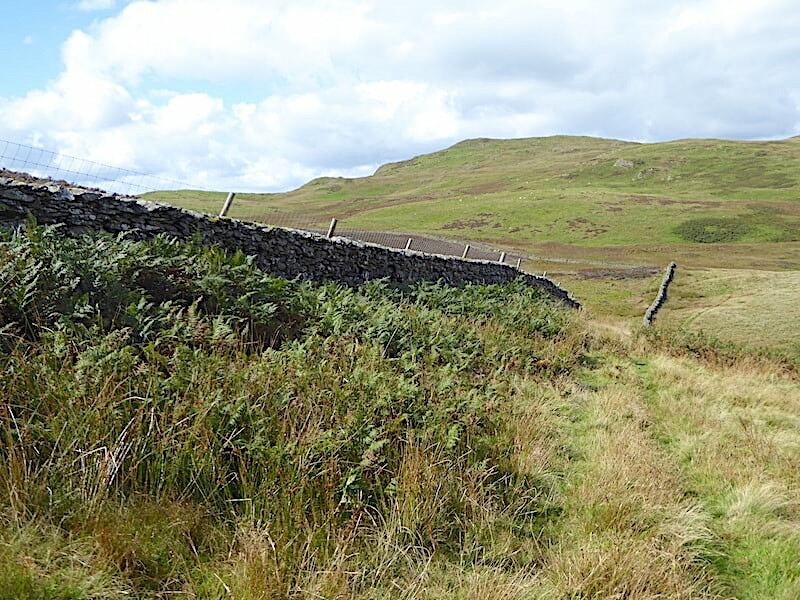 Of course we rabbited on then about stone walls and the building thereof and missed the path we wanted to take around Middle Taggleshaw Tarn which is almost completely silted up and is now nothing more than a watery bed of reedy vegetation. We should have been on a path on the other side of the tarn which would have brought us out onto …..
….. the path on the north side of Gurnal Dubs instead of the rough road track which appeared in front of us. 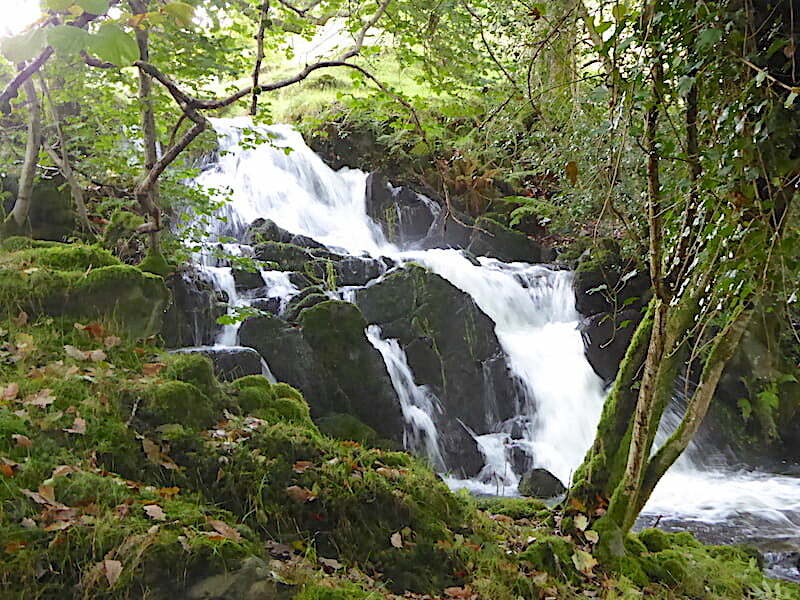 It didn’t really matter all that much, Gurnal Dubs is lovely whichever path you use to walk around it. 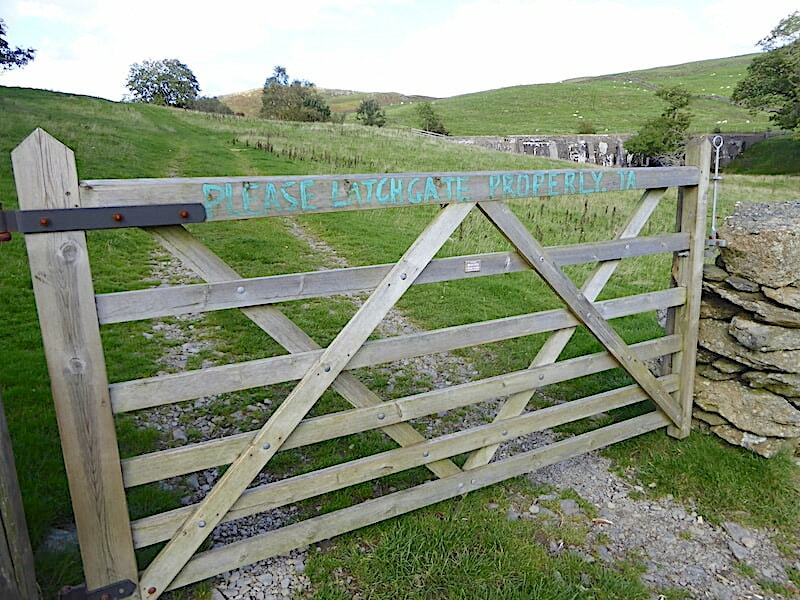 The annoying thing was that we now had to cross a stout wall topped with a wire fence to get onto the rough road track. 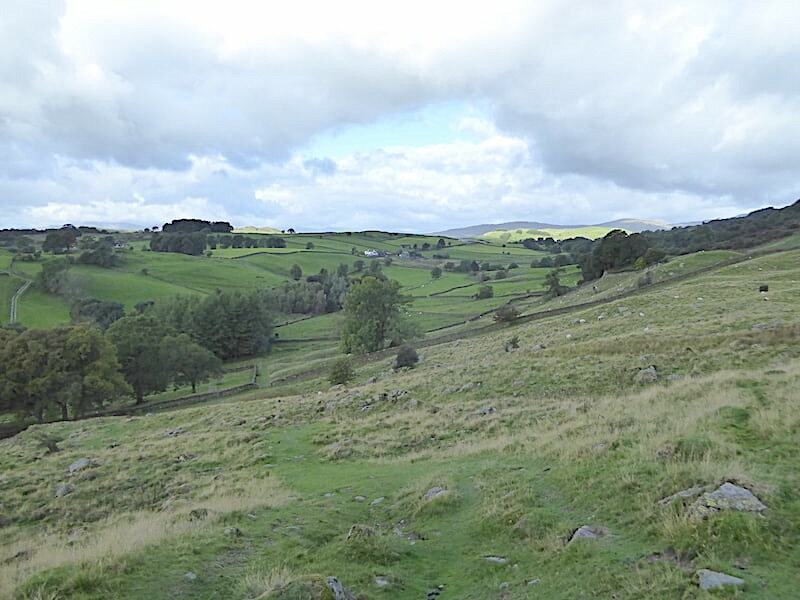 Had we been paying attention and followed the path we should have taken it would have led us to a stile in a wire fence beyond which was the path on the other side of the tarn. I don’t really like to climb over walls which people clearly don’t want you to, so suffice to say that we managed and damaged neither the wall nor the fence topping. 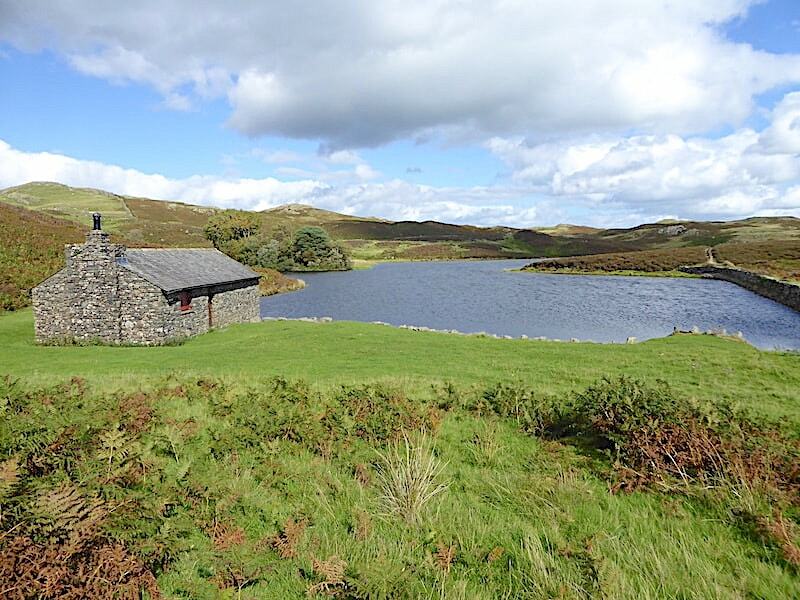 From the rough road track we followed a footpath alongside the tarn and over to the boathouse. 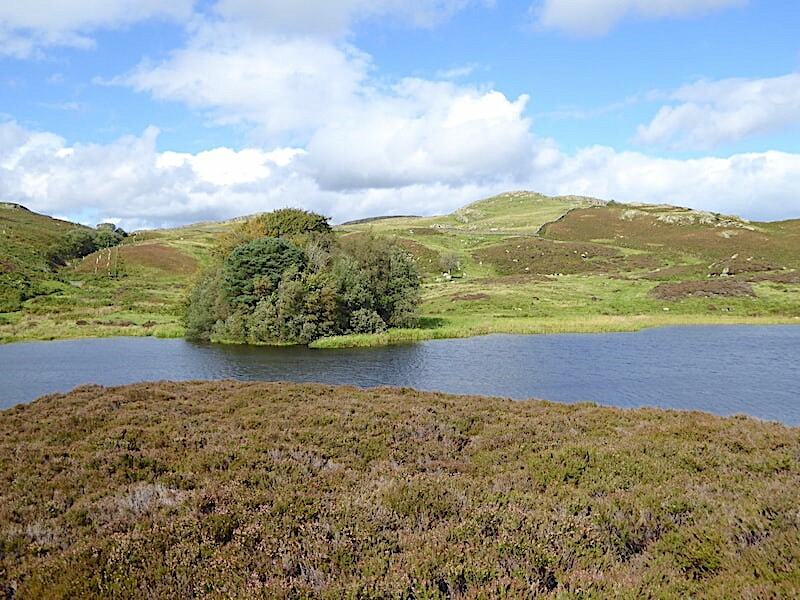 There were plenty of notices about fly fishing, for members only, dotted around but we’re not here for the fishing, we just wanted to enjoy the loveliness of the tarn and its tranquil setting. 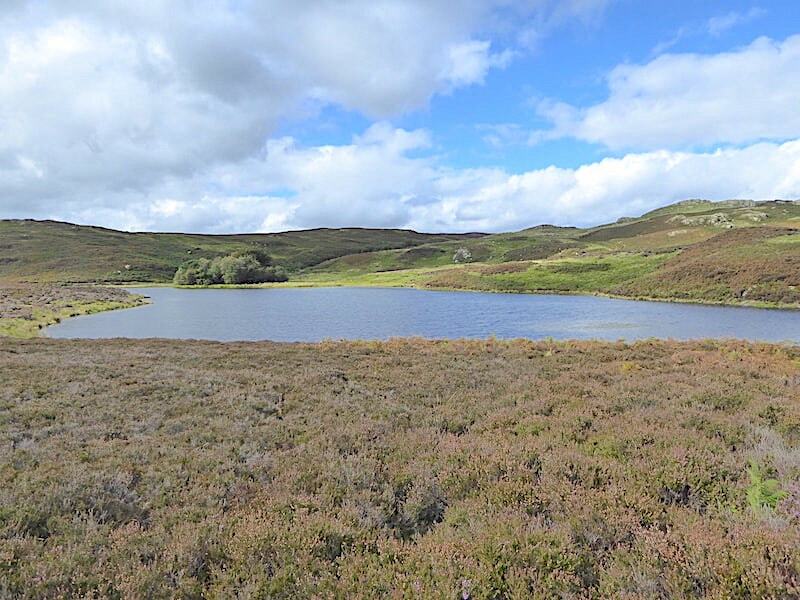 The tarn is artificial having been created by erecting a dam which enclosed three smaller tarns, or dubs, to form this much larger one in a very attractive setting. On the north shore is this little island although it looks as though it is gradually being surrounded by reed beds so its likely that in future it will become little more than a small peninsula. 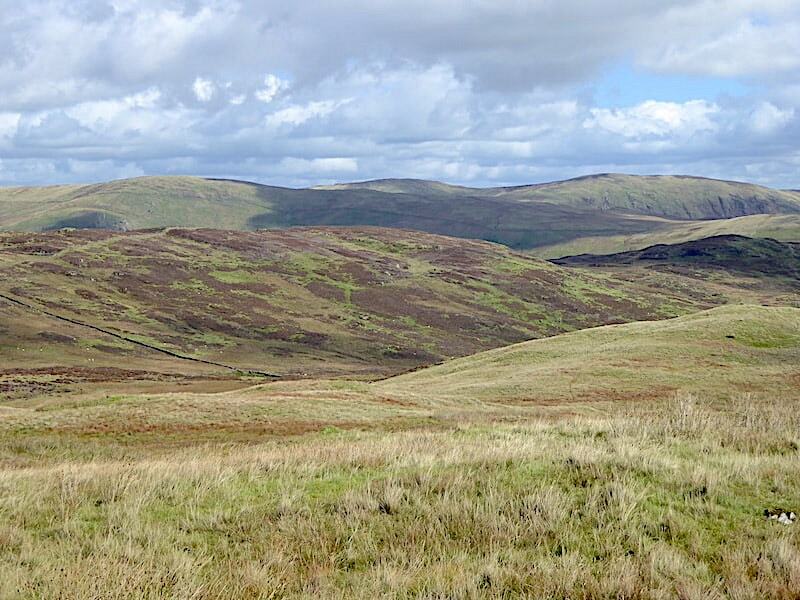 On the far left of the skyline is Ulgraves and behind me the setting is much the same, low rolling hills encircling the tarn in a secluded and peaceful setting. 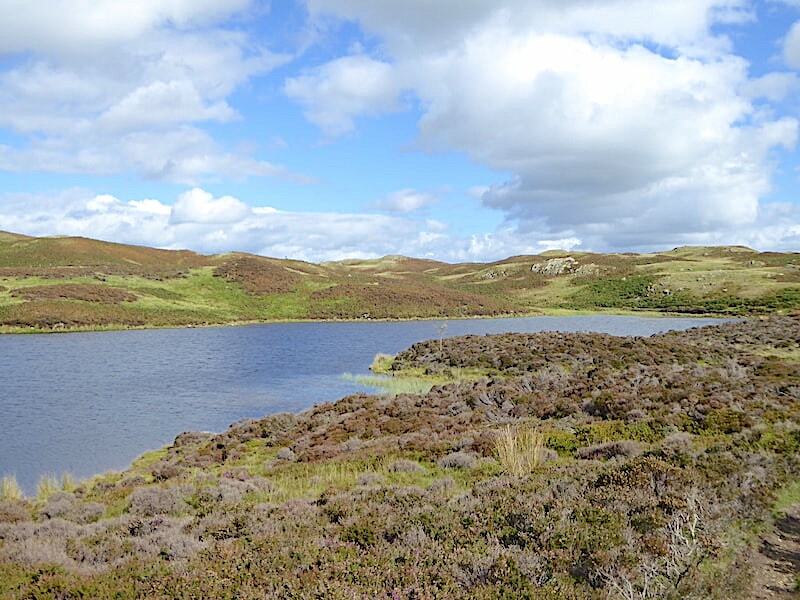 Looking towards the far end of the tarn where we arrived at and where the rough vehicle track is to be found. 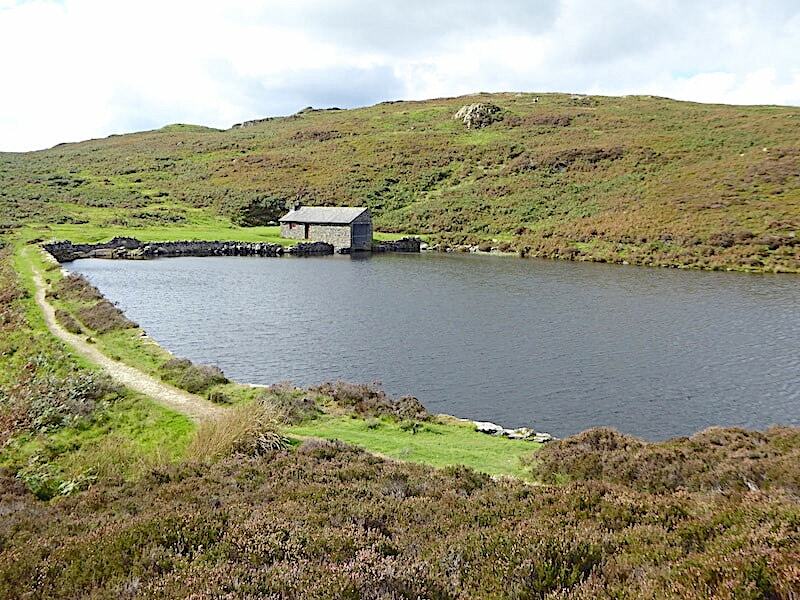 A look back at the tarn and boathouse as we prepare to leave. An enchanting spot with the fine weather helping to show it at its best. Another look back from one of several grassy paths leading us away up the small rise. 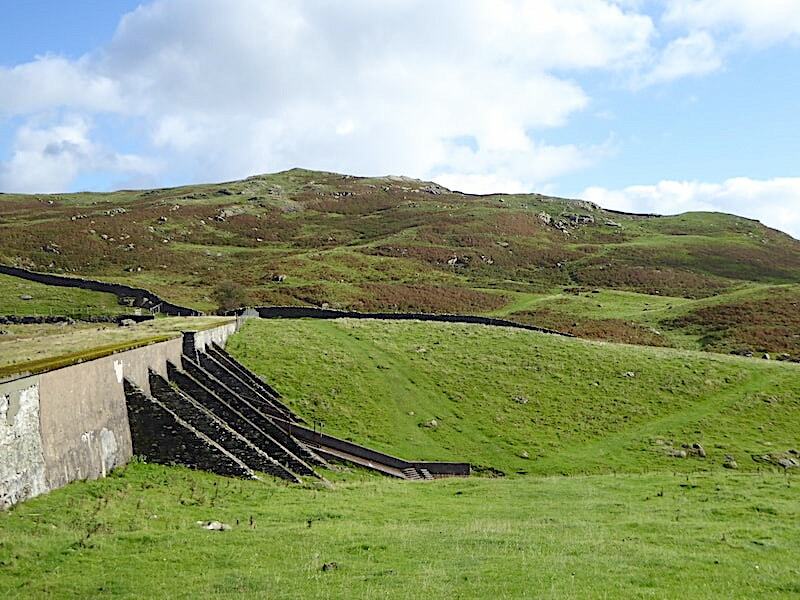 Now the dam can be seen more clearly on the right, and its covering of stone, turf and bracken allows it to blend unobtrusively into the surroundings. 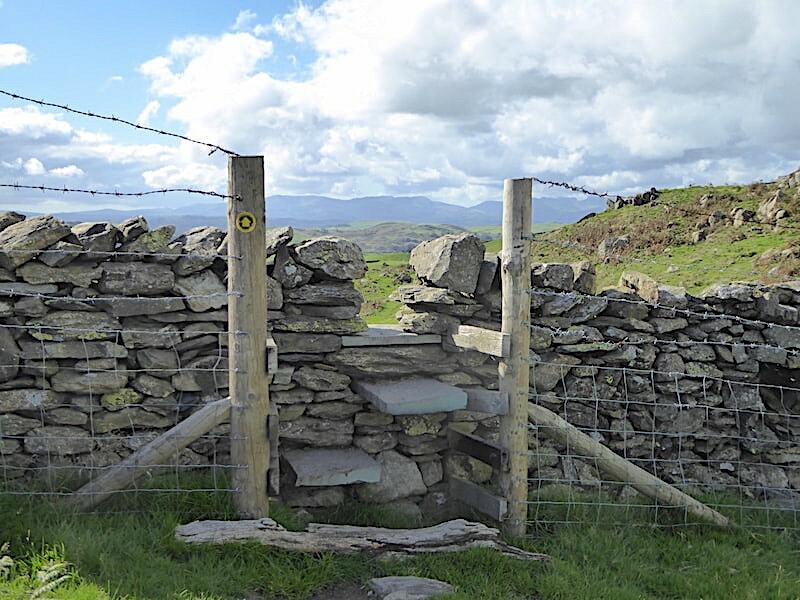 Its a bit of a wrench but we turn around and continue up the slight rise …..
….. to this wall and stile crossing with the distant Coniston fells framed between the fence posts. 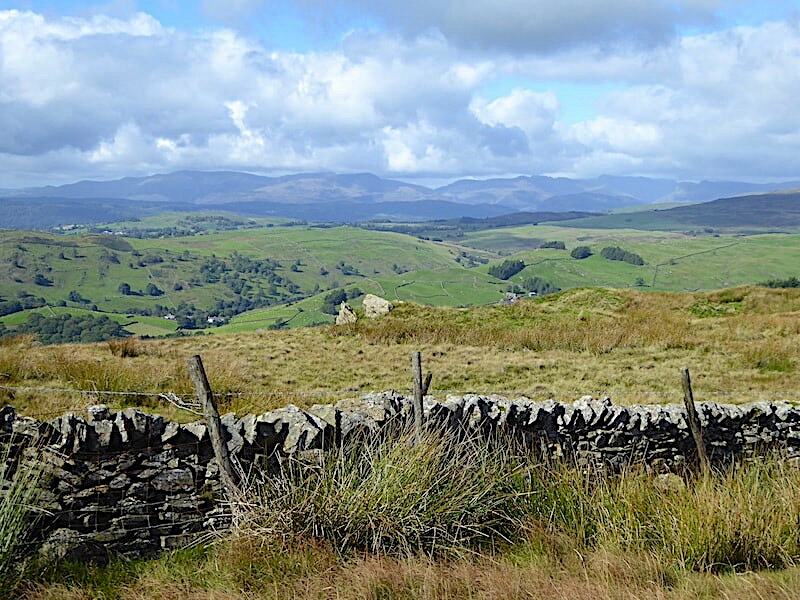 From the stile there’s a straightforward walk downhill back to Potter Tarn during which we meet the second solo walker of the day, this time a lady of middle years whose face was shiny with perspiration as she toiled up the hill with the sun on her back. We’re very warm too now, the sun is high, the breeze has lessened and its altogether much more pleasant than when we first started out. 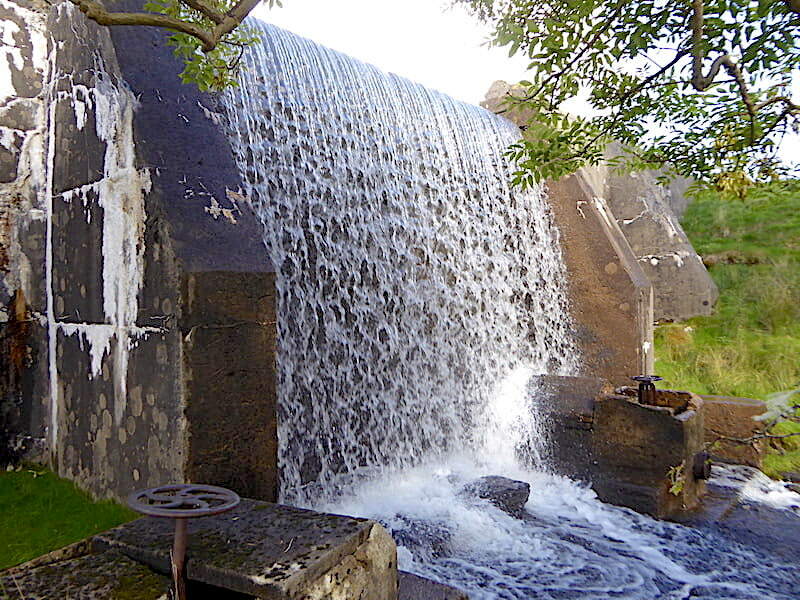 We pass below the dam retaining wall and walk down beside the tarn outflow. 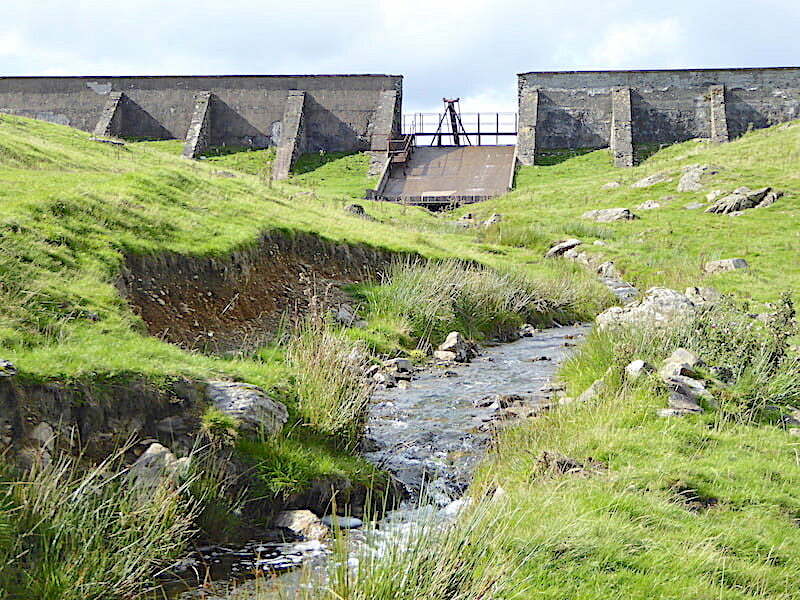 This morning J had wondered why the dam walls were so much higher than the overspill and I remembered reading somewhere or other that the tarn had been created originally to supply water to the James Cropper paper mill at Burneside, near Kendal. 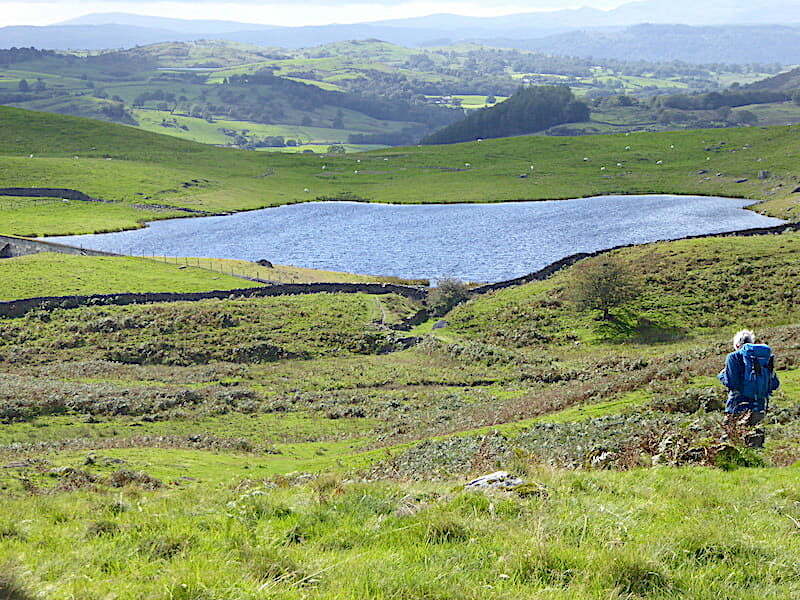 The tarn is now smaller than it was originally because the dam had become unsafe. 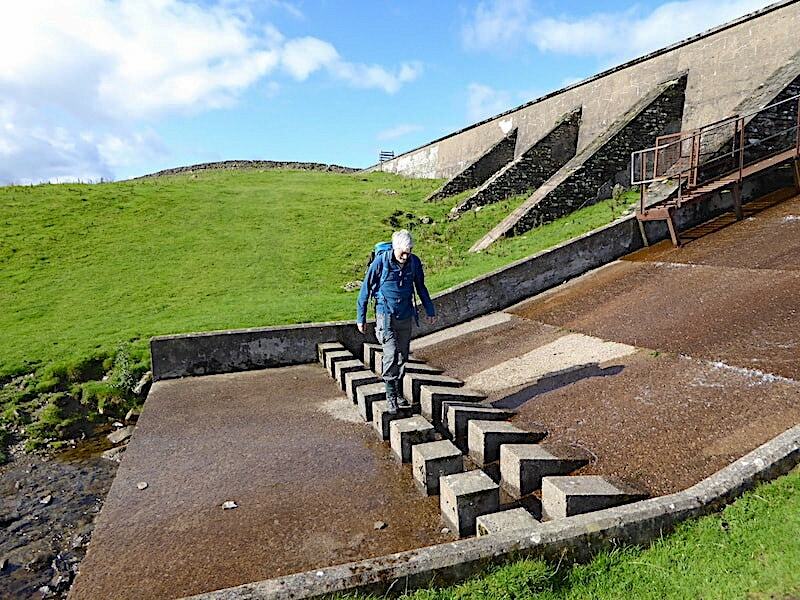 A lower spillway was created across the middle of the dam thus reducing the water level in the tarn and ensuring the dam walls would not collapse under the weight of the water behind them. 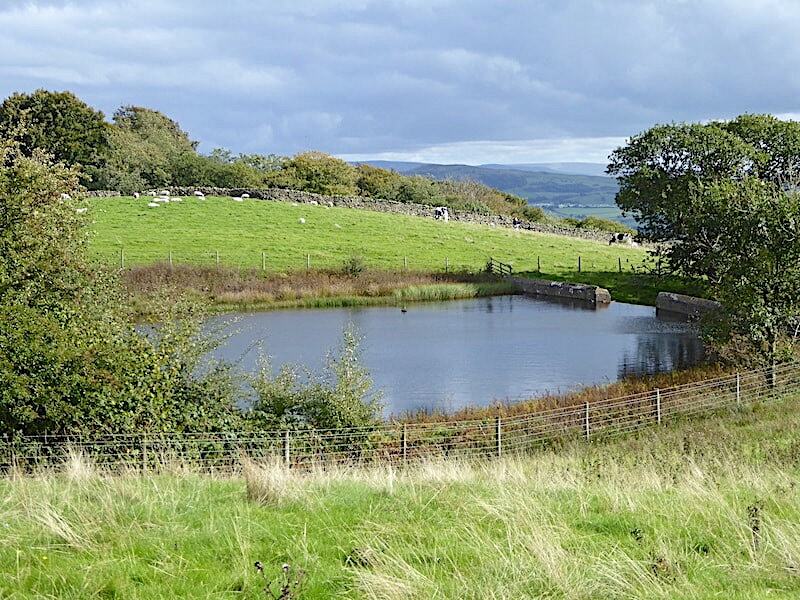 Further down the path is Ghyll Pool, another reservoir also constructed to provide water for the paper mill. 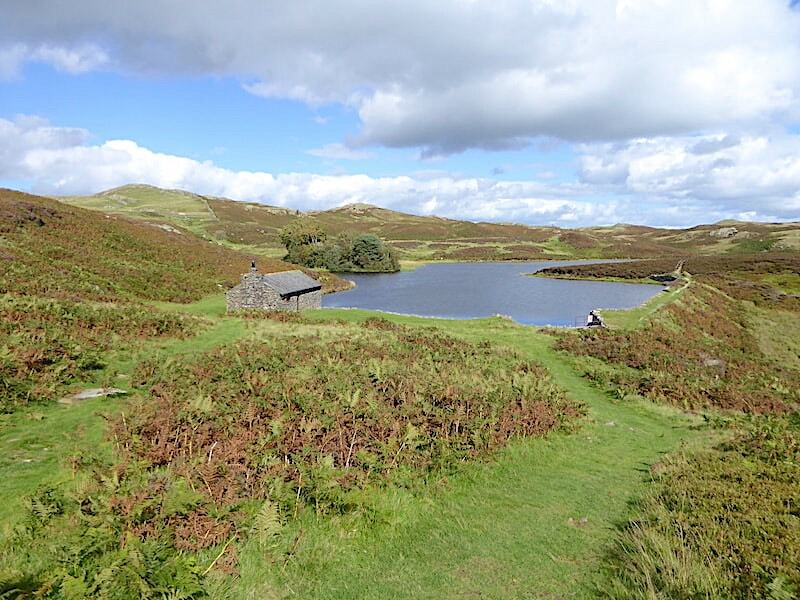 This is much smaller than Potter Tarn but is still pretty to view. The surrounding fence keeps the animals, and us, at bay but we drop down around the dam wall and make our way over to the spillway behind the trees. Its only a matter of yards from the path and the overspill is largely obscured by the trees as we approach it but they don’t restrict our access to it. Entirely man made and strictly functional but still attractive since the water creates ever changing patterns as it pours over the spillway. And yes, J reverted to being ten years old and just had to have a go at turning the wheel. Thankfully it wouldn’t budge, who knows what might have happened if it had. We leave Ghyll Pool, its dam walls still in view above the top bar of the gate which carried a short, but polite, request with which we dutifully complied and then carried on down …..
….. through a lovely wooded dell alongside the beck coming down from the Ghyll Pool outflow …..
….. at the end of which we reach this newish signpost which has been split asunder by some event or other, hopefully not vandalism but a natural event. 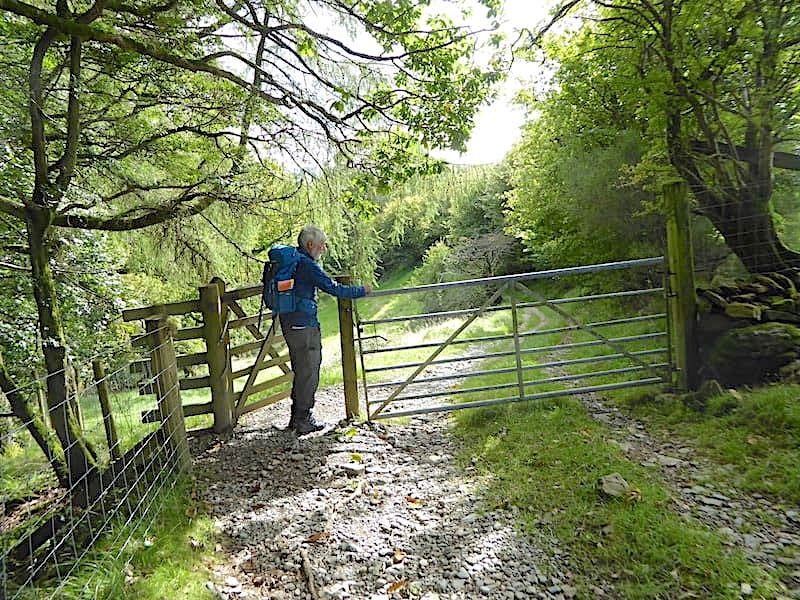 We follow in the direction of Hundhowe, down through a narrow and overgrown bridleway which soon comes out at the entrance to the few dwellings at High Hundhowe. This old and uninhabited house was quite tall and had about three floors I think, and I couldn’t fit it all into the shot without creating a distorted image of it. It would look much better if the junk littering the front was removed and it looks as though somebody, in a flush of enthusiasm, decided to whitewash the external walls, only to give up on the task and leave the whole thing looking neither one thing nor t’other. ‘A job half done is as good as none’ as the old saying goes. 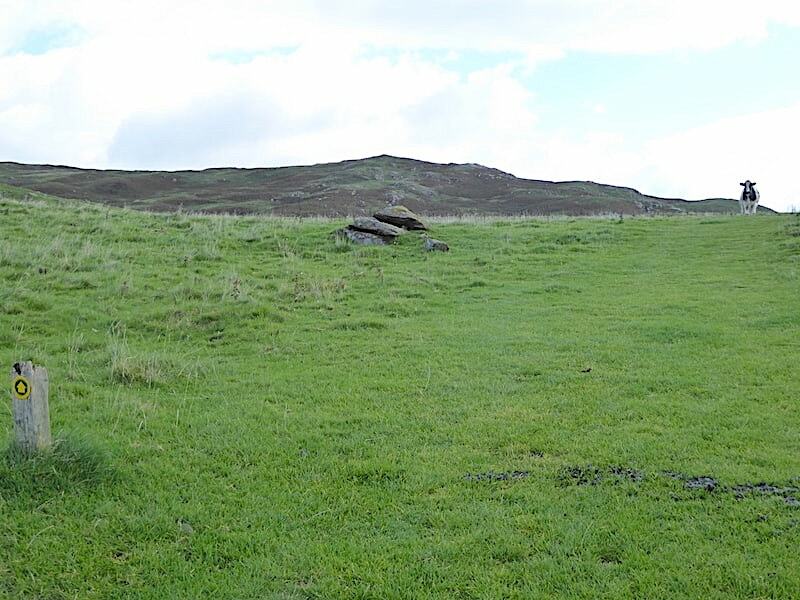 Directly opposite the old house are these later built dwellings of indeterminate age covered in twentieth century pebble dash, and that’s all there is to be seen at High Hundhowe. 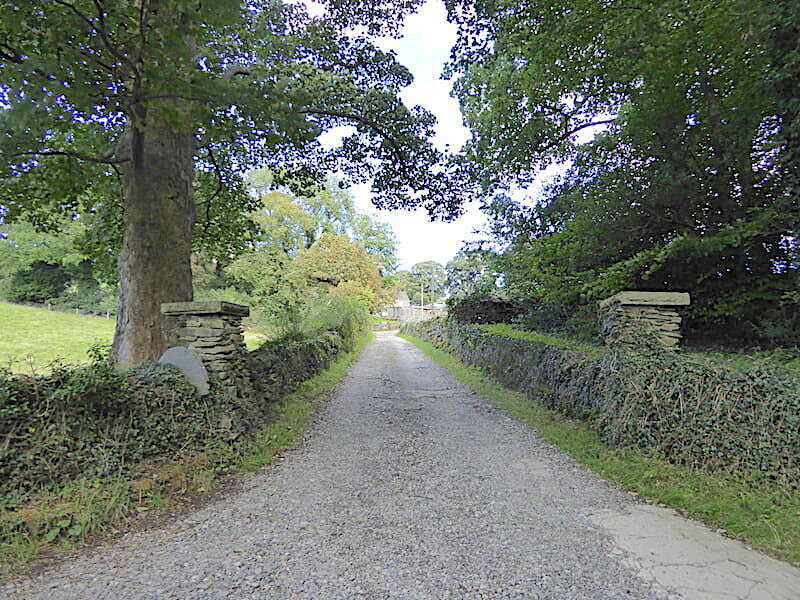 The path now meets the tarmac access lane to the hamlet and we follow it down to the road along which we parked up this morning. Back down on the road so I took a look back up the access lane to High Hundhowe. It gives the impression of the entrance to a rather grand house and probably the old house was exactly that in its day. From here we exit stage left as you look at the shot, or as AW quaintly puts it ‘If you parked a car you can reasonably expect to find it a quarter of a mile to the west.’ As usual he was perfectly correct and the car was still where we had left it. All we had to do was turn it around and drive back home the same way as we had arrived this morning. 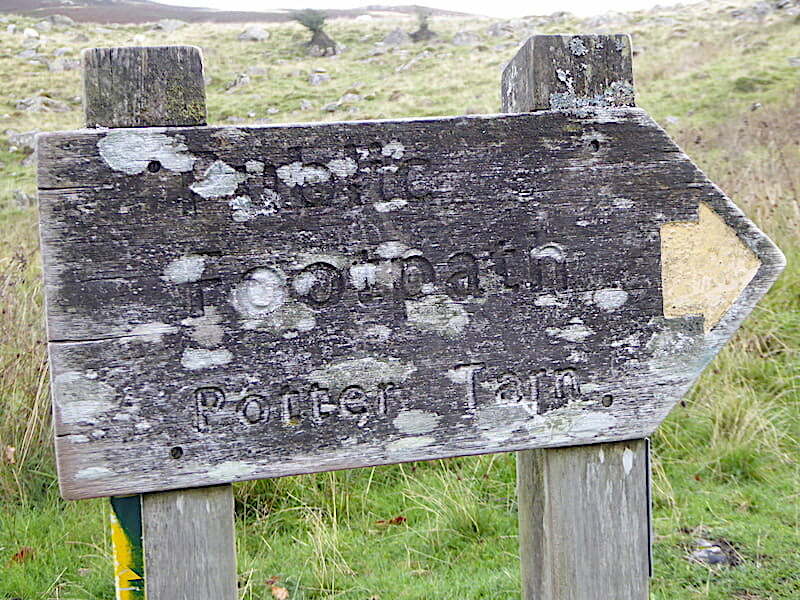 A more interesting walk than I had thought it would be to begin with, nothing excessively steep although it has its moments, nothing too boggy to get concerned about, the tarns are lovely, and the weather turned out to be much better than we expected. 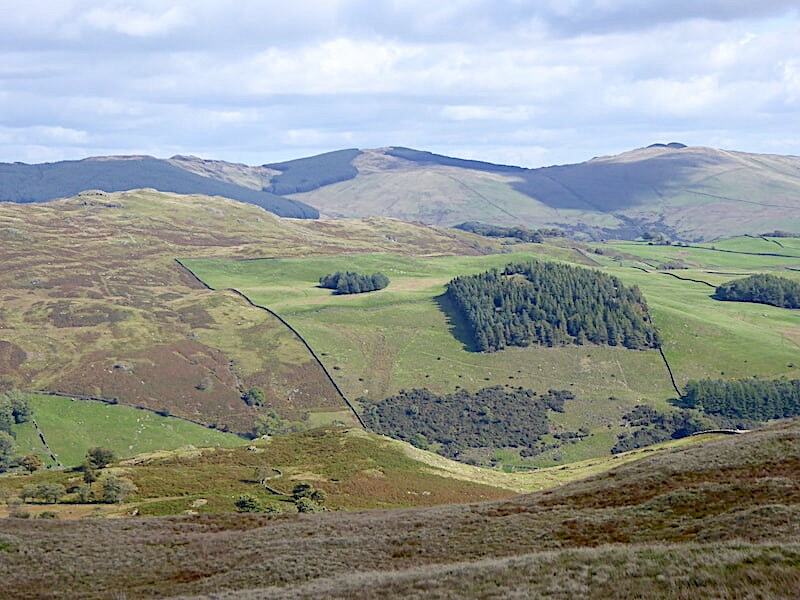 Granted its not your classic lakeland walk but its a very enjoyable one nevertheless.